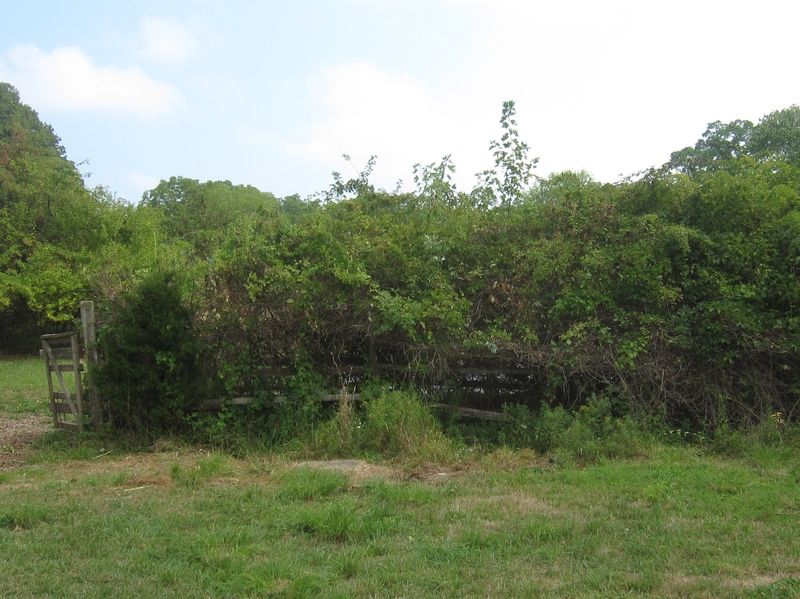 August 1, 2015: Judy, Kate, Jim and I decided it was time to remove multiflora rose and several species of invasive vines from a large maple on the west side of the lower fence. 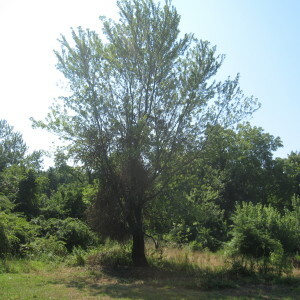 The leaves of this tree were extremely small, a sign that it was under stress. 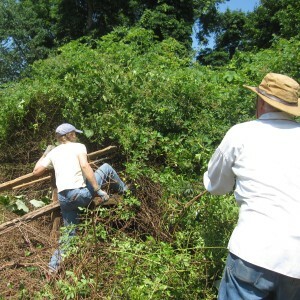 We used every tool in the box for this job: folding limb saws, a large weed wrench, loppers, pruners and even sheets of corrugated cardboard to step on and shield against massive volumes of thorny multiflora rose canes. 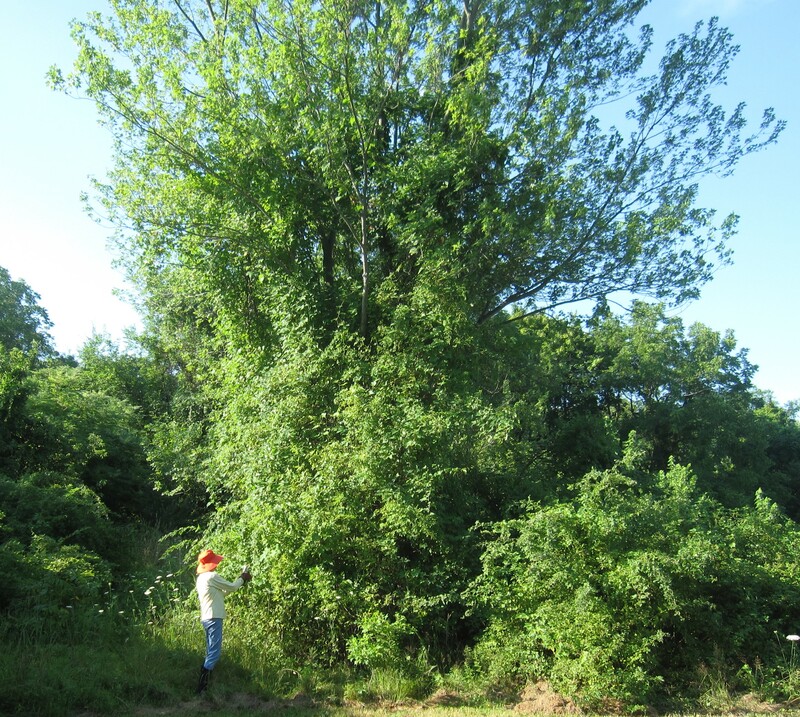 Everyone cheered when this large old maple tree was released from the vines and shrubs, which would eventually kill it. 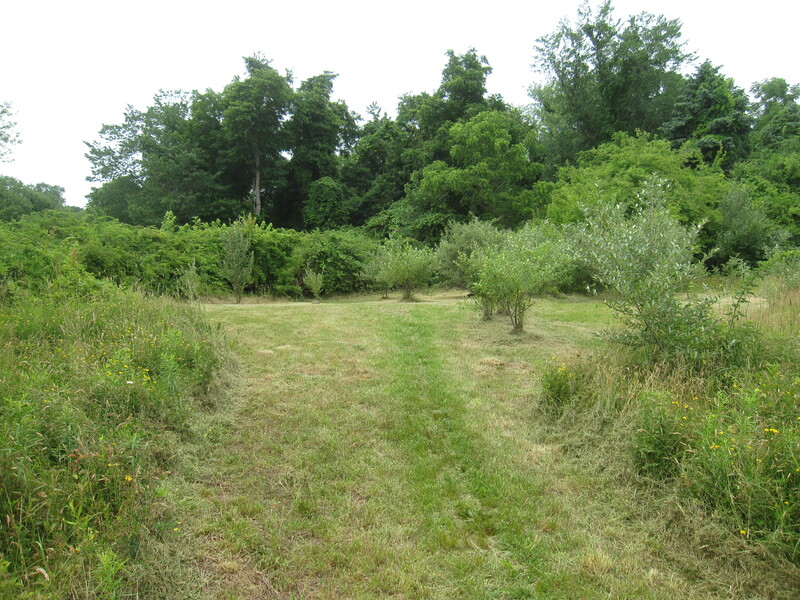 Along the fence lines and in the lower meadow are crabapple trees planted generations ago. 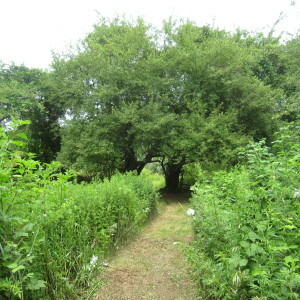 Doug Tallamy, author of Bringing Nature Home, reports these trees host over 300 species of beneficial moths and butterflies, an important food source for birds. 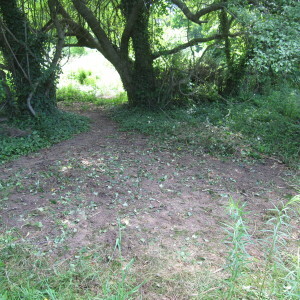 Jim cut and hacked away at the huge vines that had rooted beneath the canopy at the foot of this apple tree. 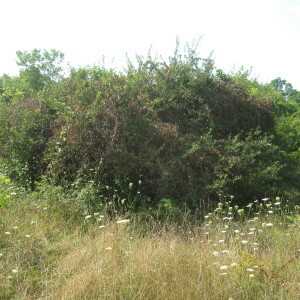 Once the leaves of the dying vines — here turning purple — drop off, the tree will have access to the light it needs to survive. 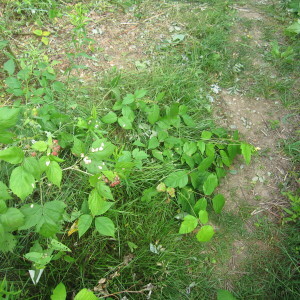 It took five of us using a shovel and pulaski axe to dig up this tenacious porcelain berry root at the lower fence line. 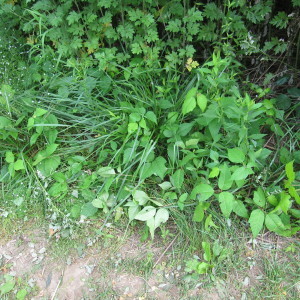 Unfortunately, any part of the root or vine left in or on the ground could regrow. 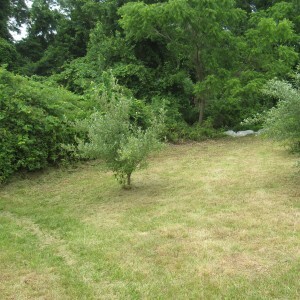 East Side of the Lower Fence with 5 Invasive Autumn Olive Shrubs. 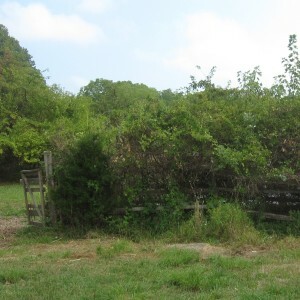 This is an earlier before-picture of the south side of the lower fence showing a row of ubiquitous autumn olive shrubs in the foreground and invasive vines covering both the fence and a large mulberry tree in the center back. 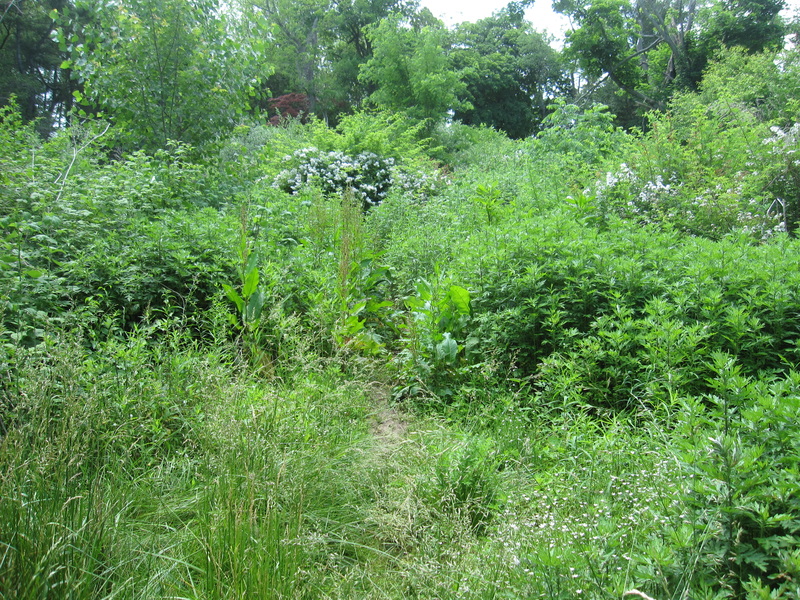 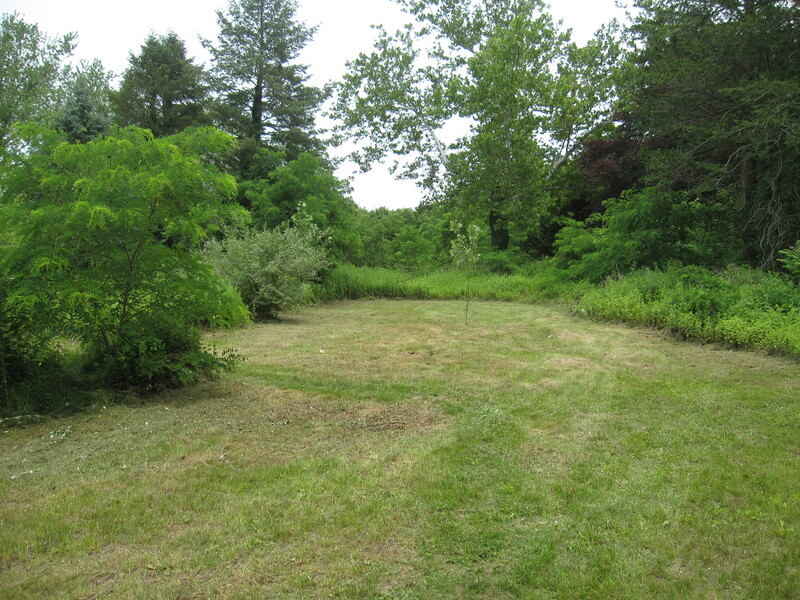 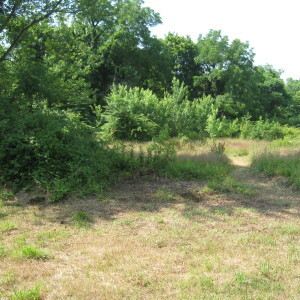 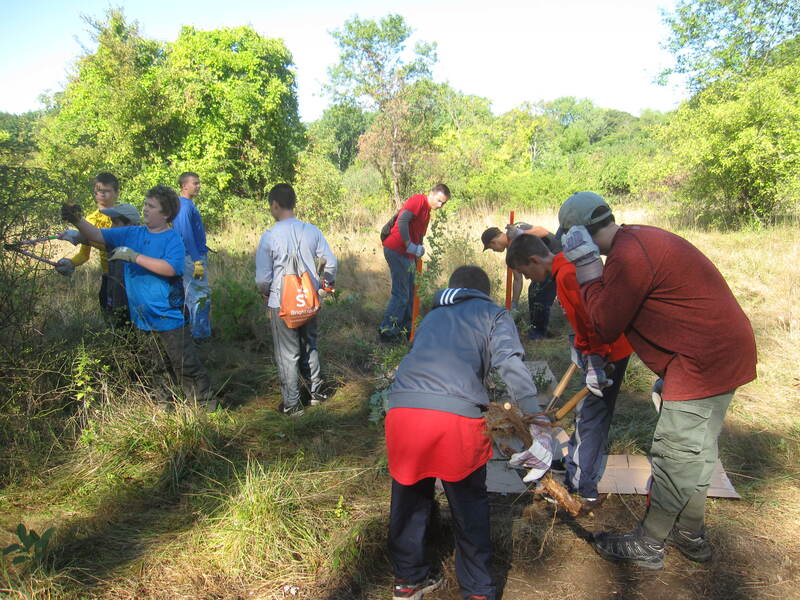 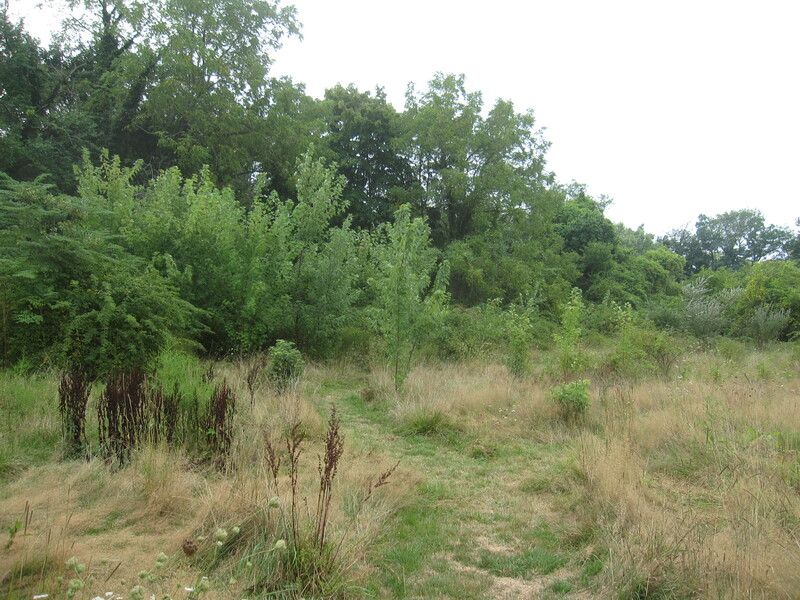 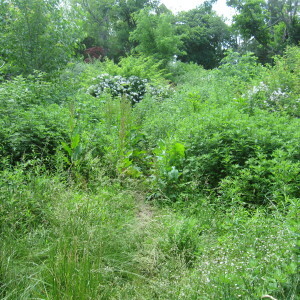 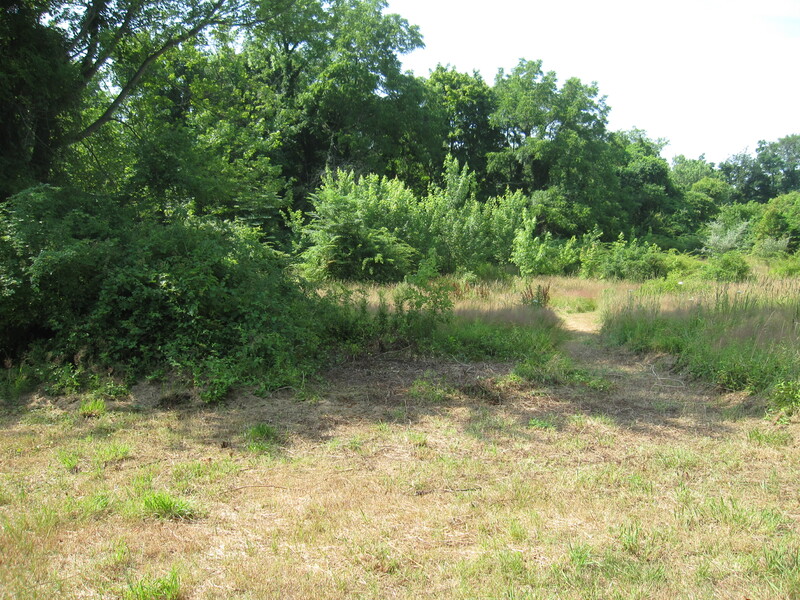 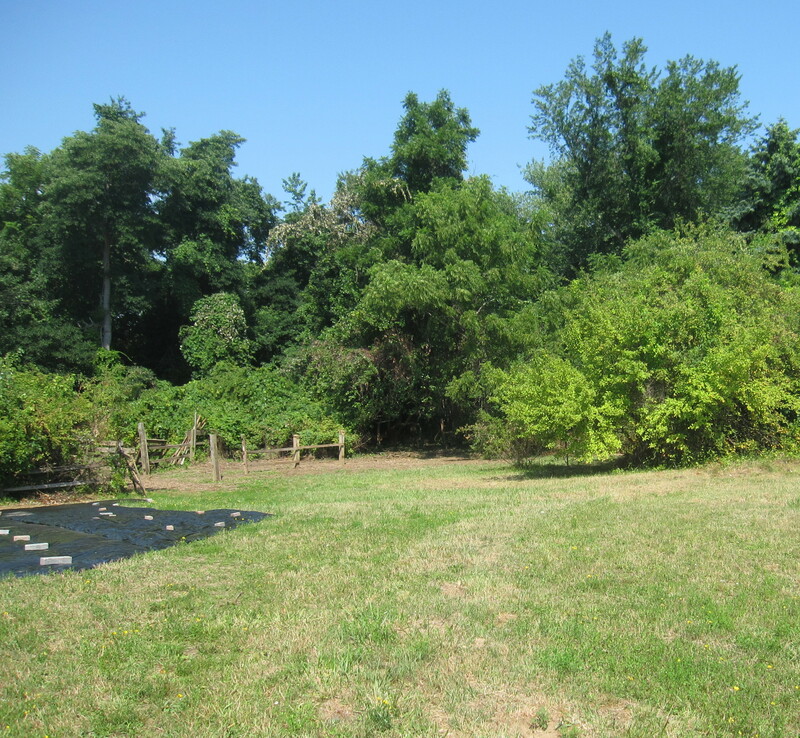 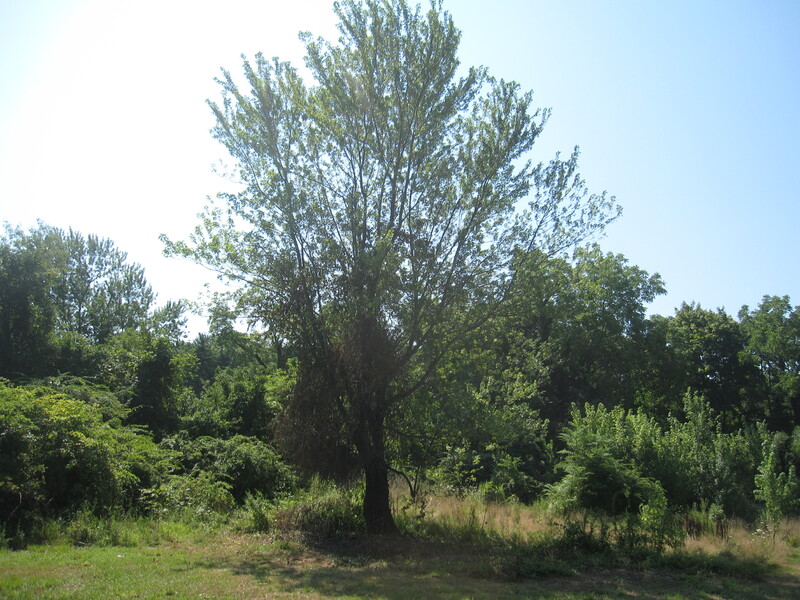 In this after-picture taken during the first two weeks in August… we cut/removed the invasive shrubs, and uprooted most vines in preparation for seeding native grasses and herbaceous wildflowers. 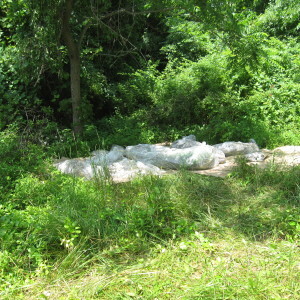 We prepared the ground between the double fence line for a garden by smothering weeds with plastic sheeting. 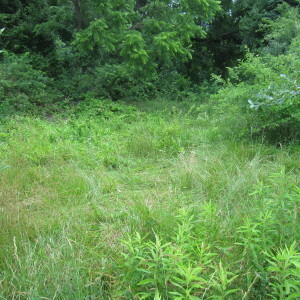 One of the plant species considered was swamp milkweed for attracting Monarch butterflies. 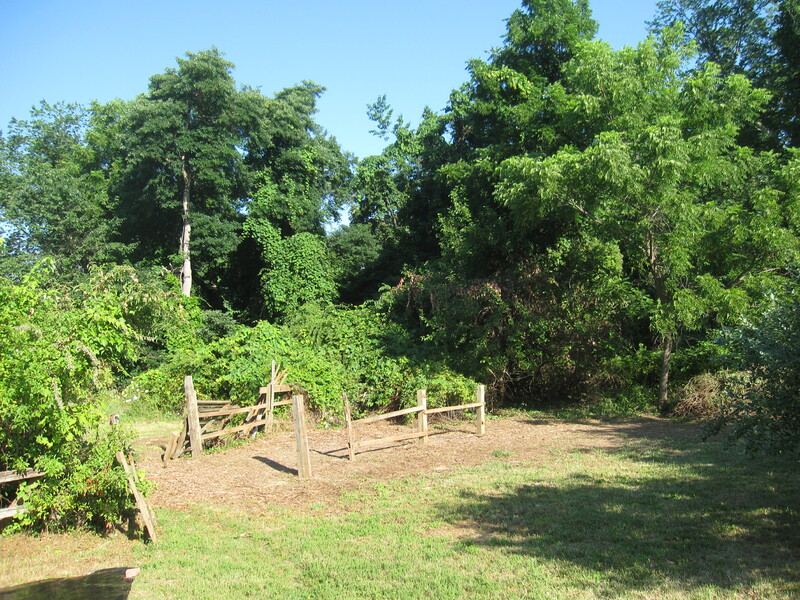 July 25, 2015: Karin, Judy and I cut and uprooted six multiflora rose shrubs, which provided support for dozens of invasive vines that reached high into two large trees — mulberry and black walnut — at the far end of the fence. 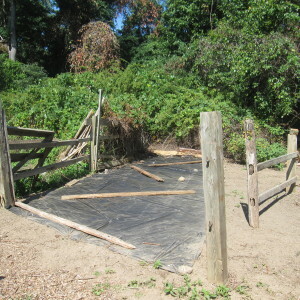 After uprooting the autumn olive we stripped the mowed area south of the fence of numerous honeysuckle root crowns, and porcelain berry, oriental bittersweet, wild grape and creeping euonymus roots between the fences before laying black sheeting. 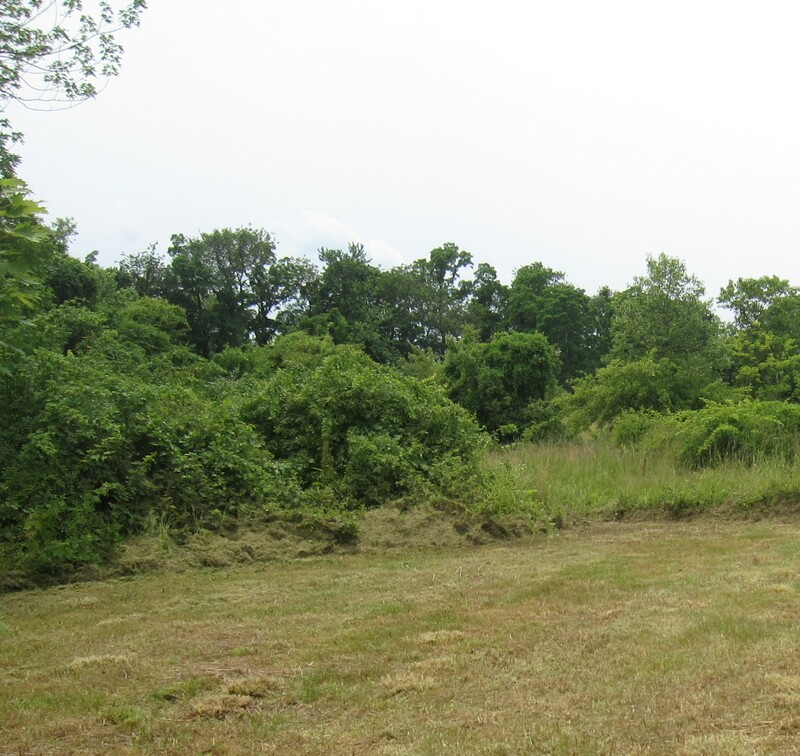 In preparation for more plastic sheeting, we pulled roots from the grassy area south of the west portion of fence that had also been cut with a brush hog and mower. 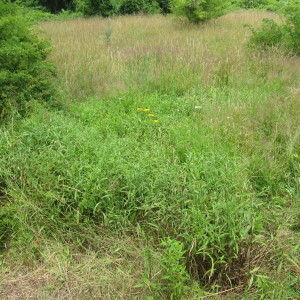 This is where poison ivy, spotted knapweed and honeysuckle bushes had infiltrated the cool season grasses. 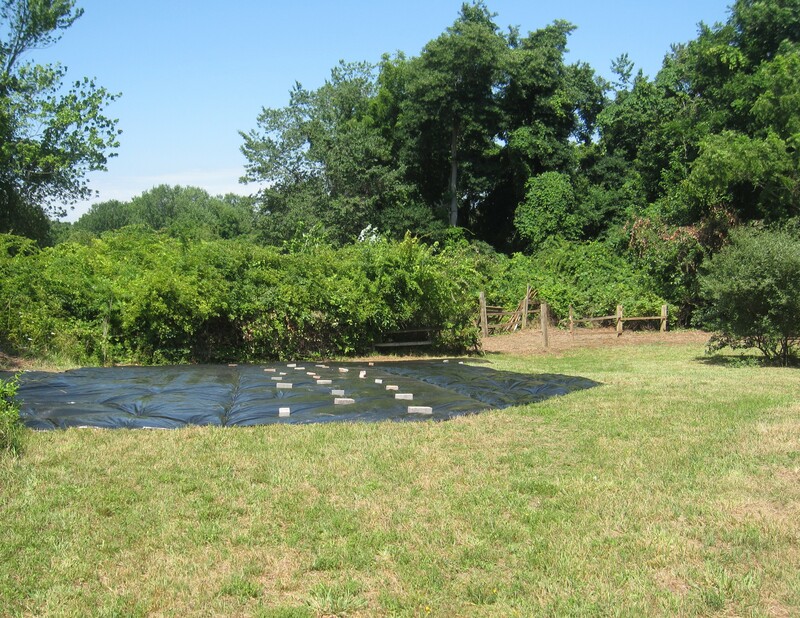 July 29, 2015: We laid and stapled black plastic sheeting over the clearing to smother existing growth by inhibiting photosynthesis. 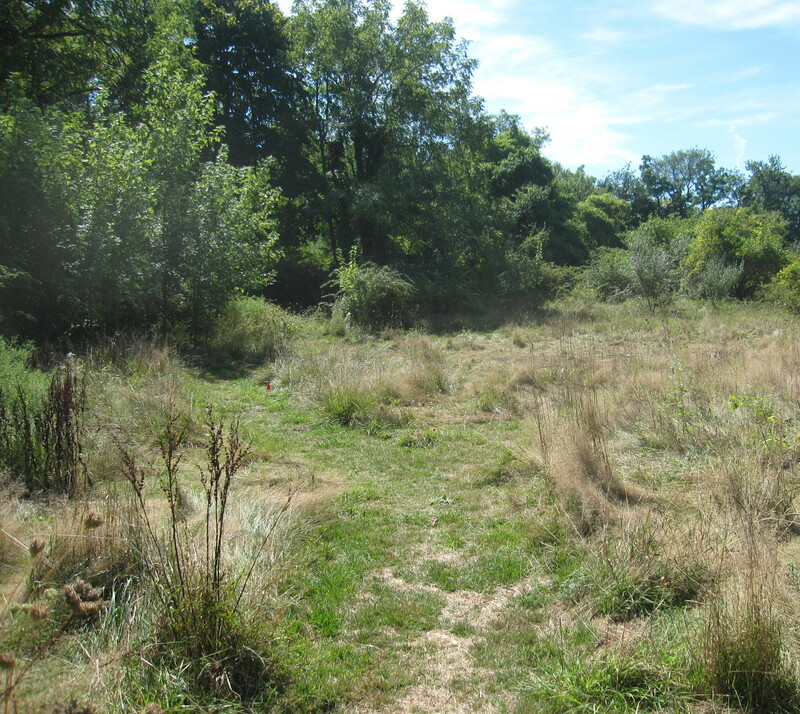 Once devoid of cool season grasses and weeds we will remove the plastic to broadcast native grass and wildflower seeds. 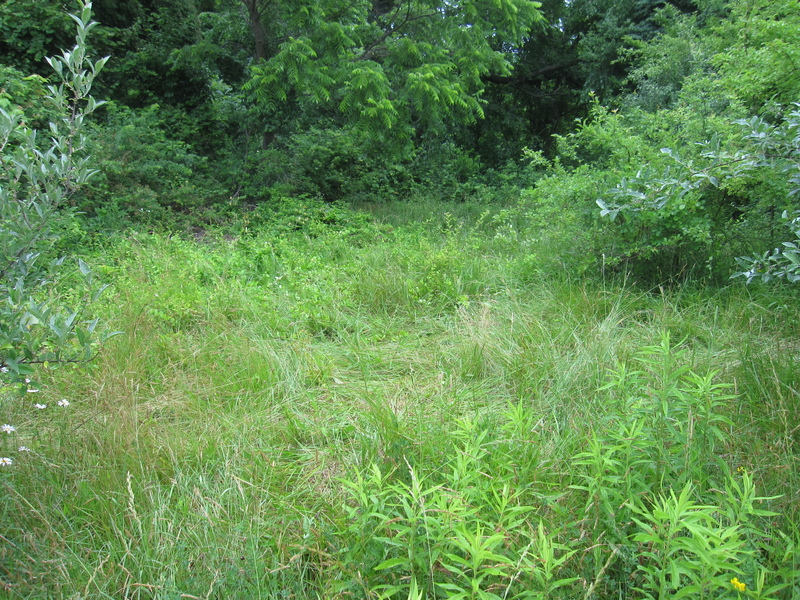 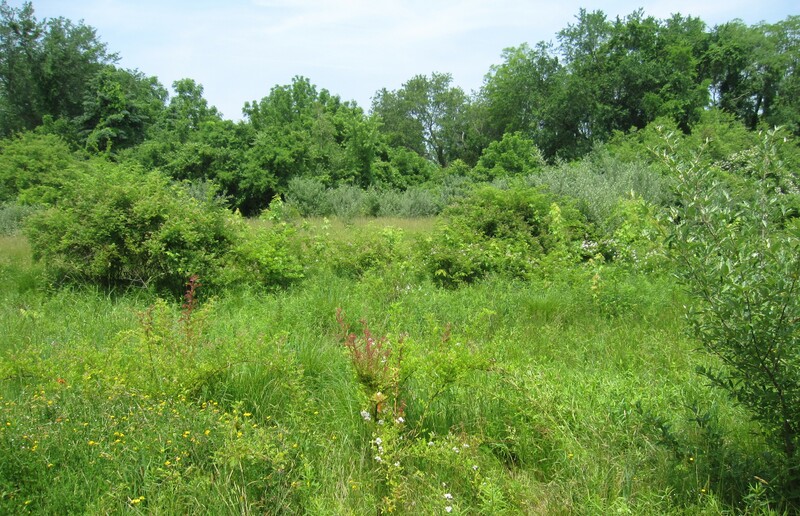 July 3, 2015: Various methods exist for eliminating invasive weeds from a field of tall grass. 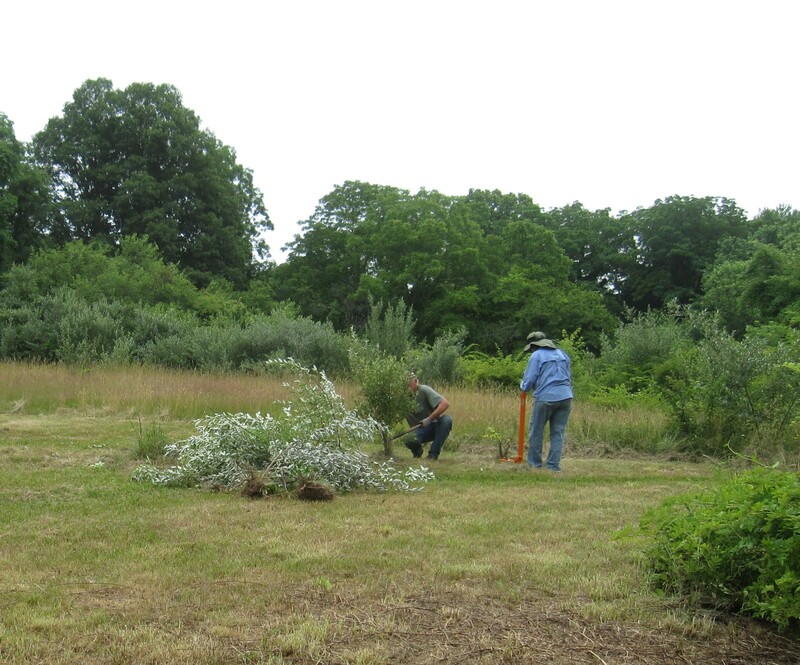 Volunteer Susan Guarlnick cut, removed and solarized invasive brown knapweed in the lower meadow using pruners. 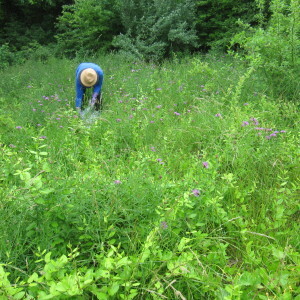 Selective Cutting/Solarizing Spotted Knapweed Seed HeadsThe following day I cut and removed large clumps of brown knapweed flowers and seed heads using a sickle. 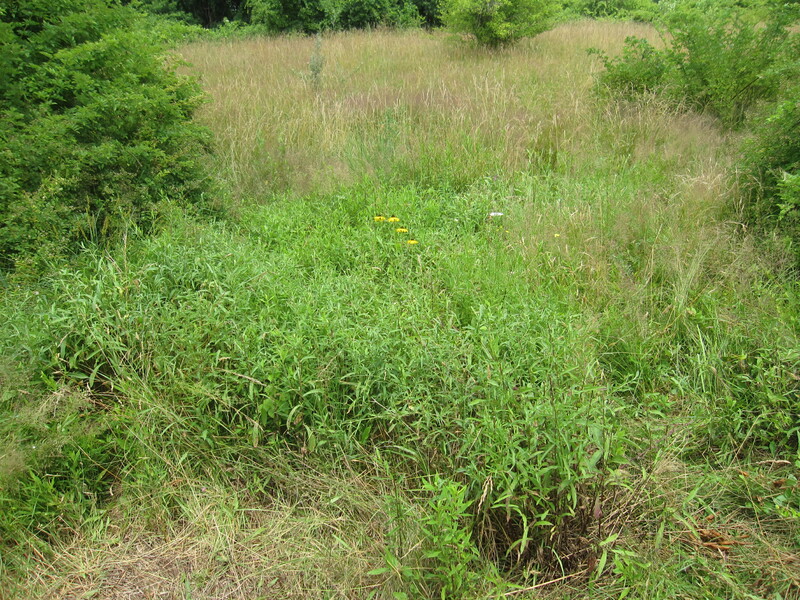 Faster than with a pruner, I was still able to selectively leave wildflowers like black- eyed-susan and goldenrod untouched. 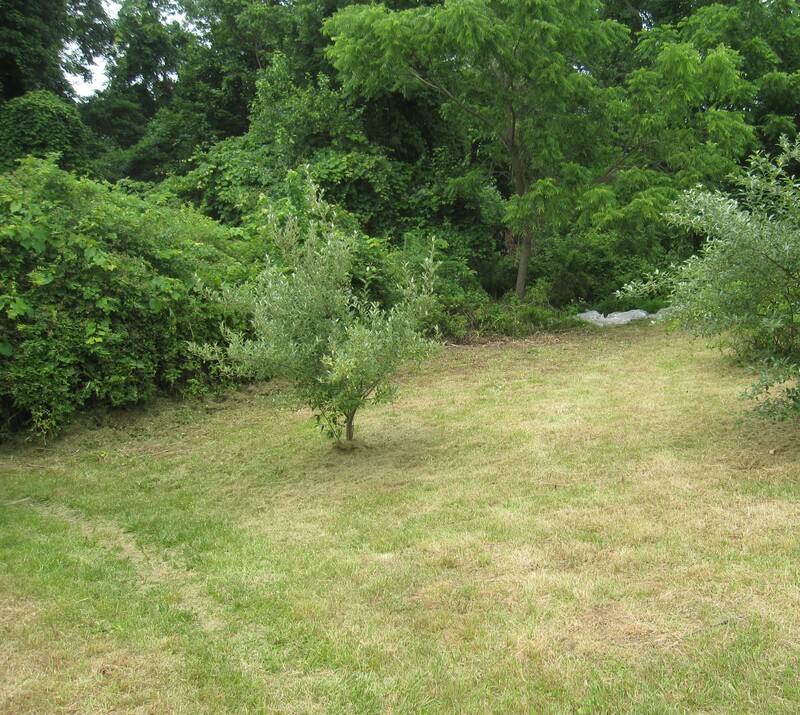 After mastering the art of cutting and uprooting a smaller multiflora rose, Michelle Mitard and her two sons Russel and Kyle eliminated a large shrub that hid the newly blazed trail. 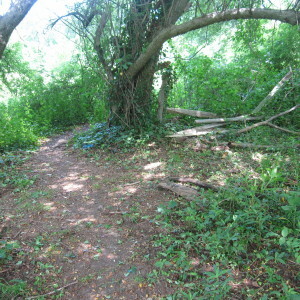 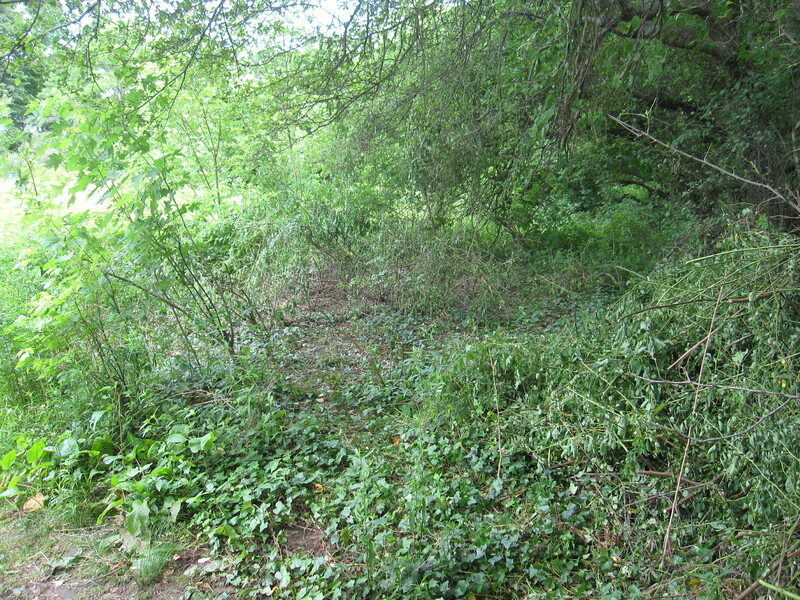 Once the shrub was removed the trail came into view. 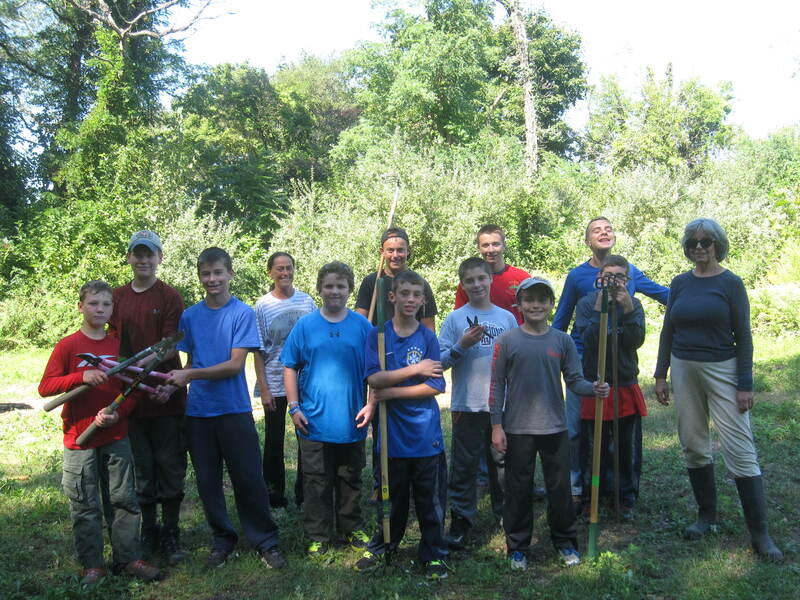 Russel and Kyle are boy scouts who will receive service points for their volunteer work. 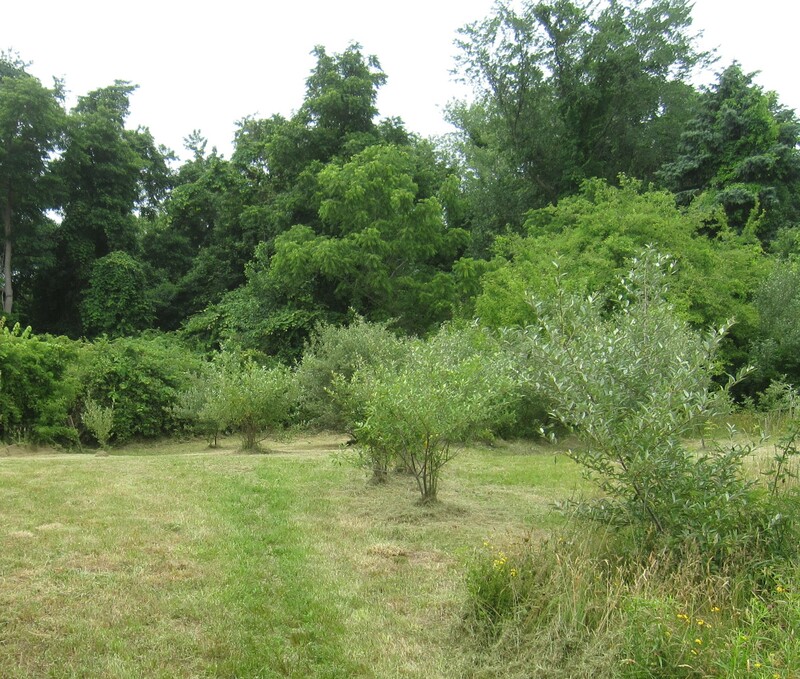 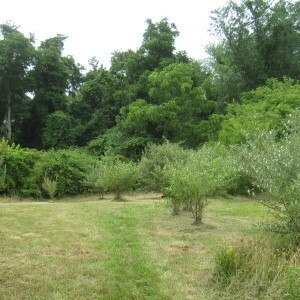 July 4, 2015: A line of small autumn olive shrubs marked the outer edge of the former horse paddock. 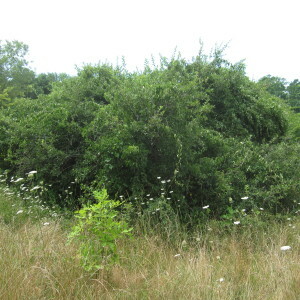 Although attractive, these shrubs are not native and are spreading by birds throughout Long Island. 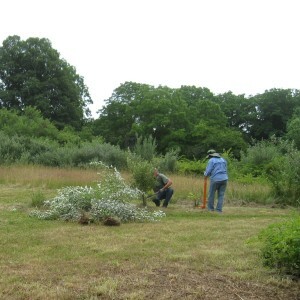 Debbie Hanley and Jim Bentson cut eight small autumn olive shrubs, uprooting them with a large weed wrench. 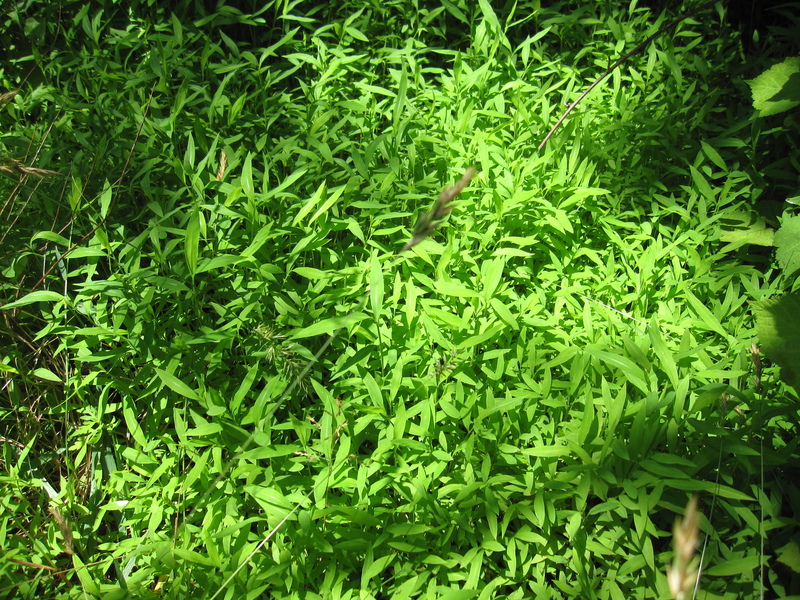 Later, lateral roots were extracted (unfortunately, not entirely) to prevent regrowth from any remaining segments. 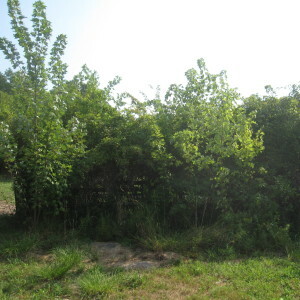 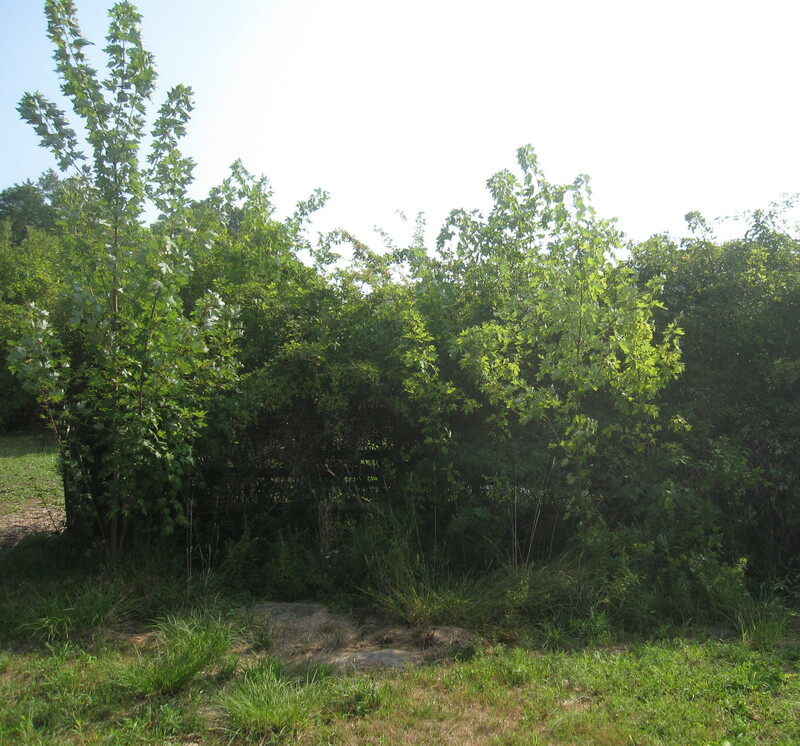 July 8, 2015: Approaching the lower fence, I discovered a tree hidden behind multiflora rose, oriental bittersweet and porcelain berry. 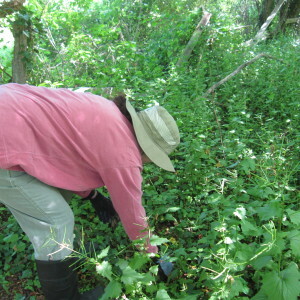 Wearing thick leather work gloves, I spent an hour or two cutting down the shrub and vines with long loppers. 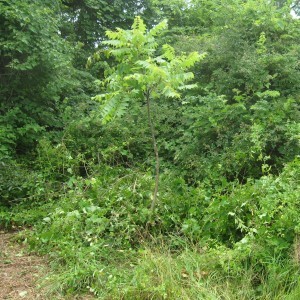 Once freed from the tangle of invasive plants the tree turned out being native black walnut. 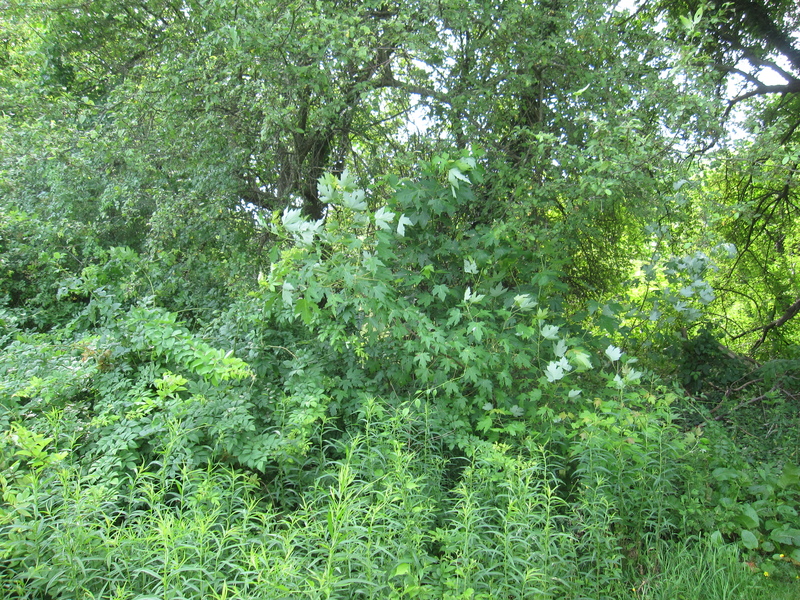 These trees have the reputation of producing chemicals that inhibit plants from growing beneath its canopy. 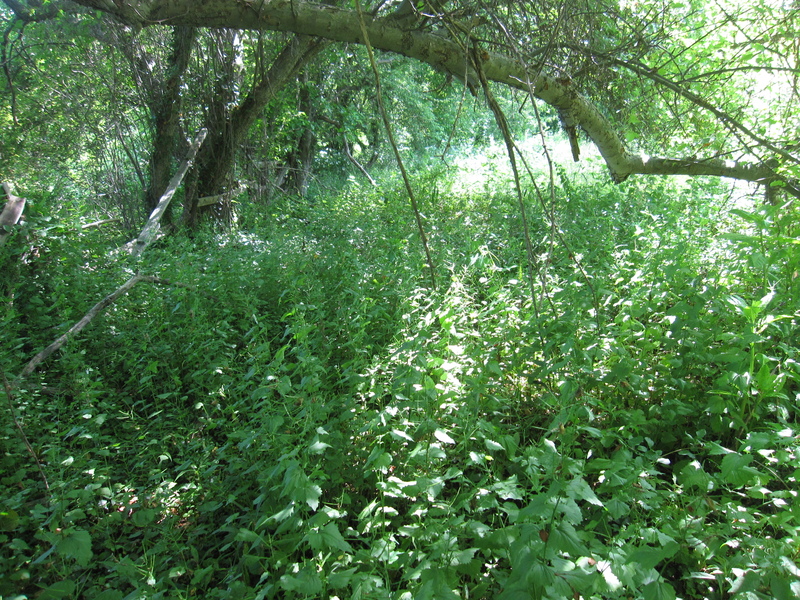 However, it appears non-native invasives are far from being sensitive. 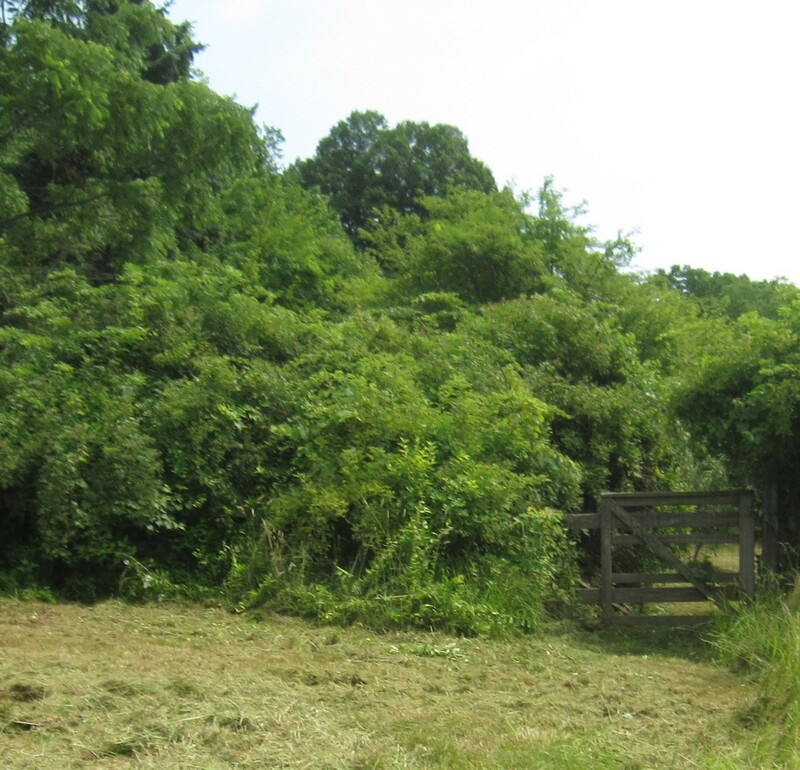 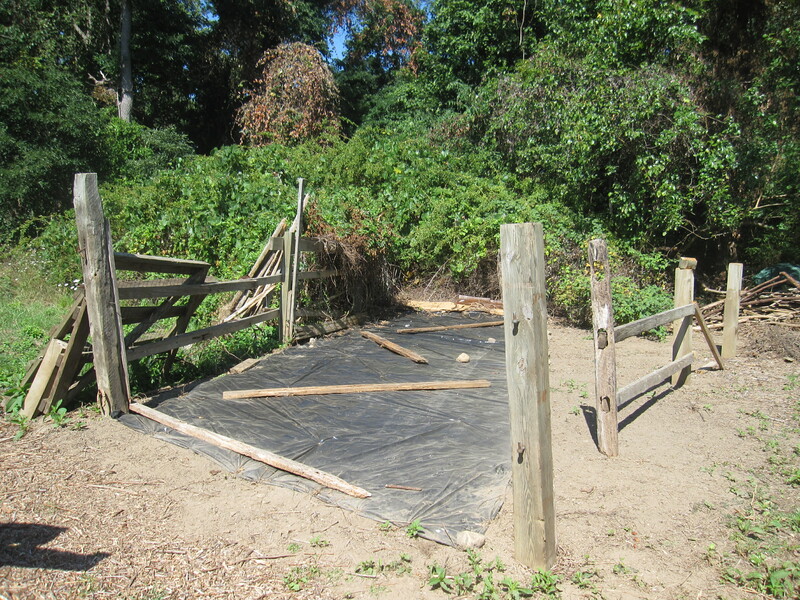 The old fence with its narrow gate was an obstacle for the crew and machines that mowed the trail through the meadow. 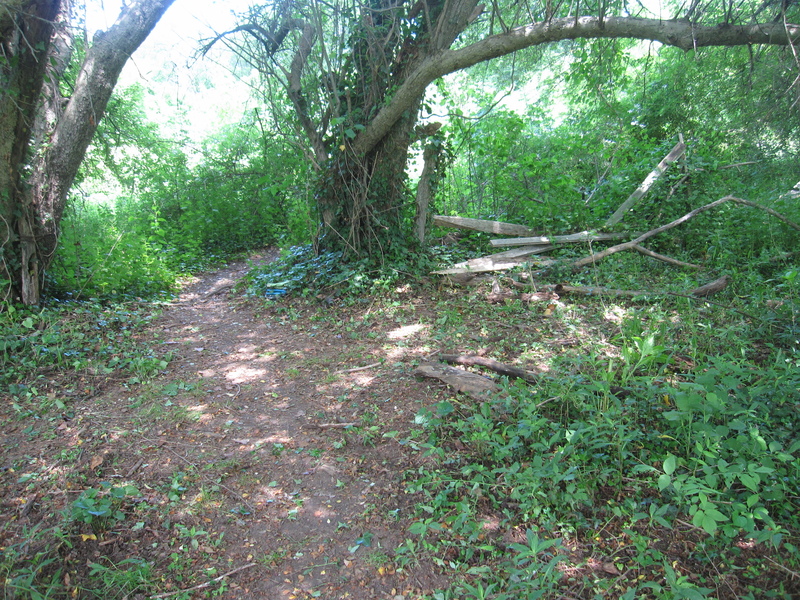 It turned out to be a double fence line where invasives had established a tangled foothold within the ten feet of space separating them. 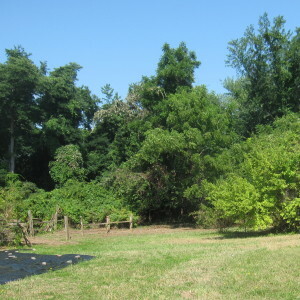 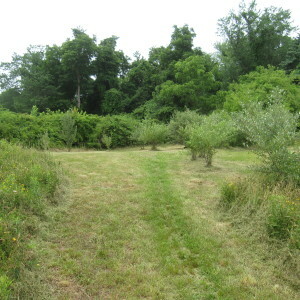 Thanks to the powerful efforts of Karin Ralph, a twenty year landscaping professional, and farmer Jim, we cut and removed multiflora rose, oriental bittersweet, porcelain berry and a new arrival, creeping euonymus, from between the two fences, widening the meadow’s entrance. 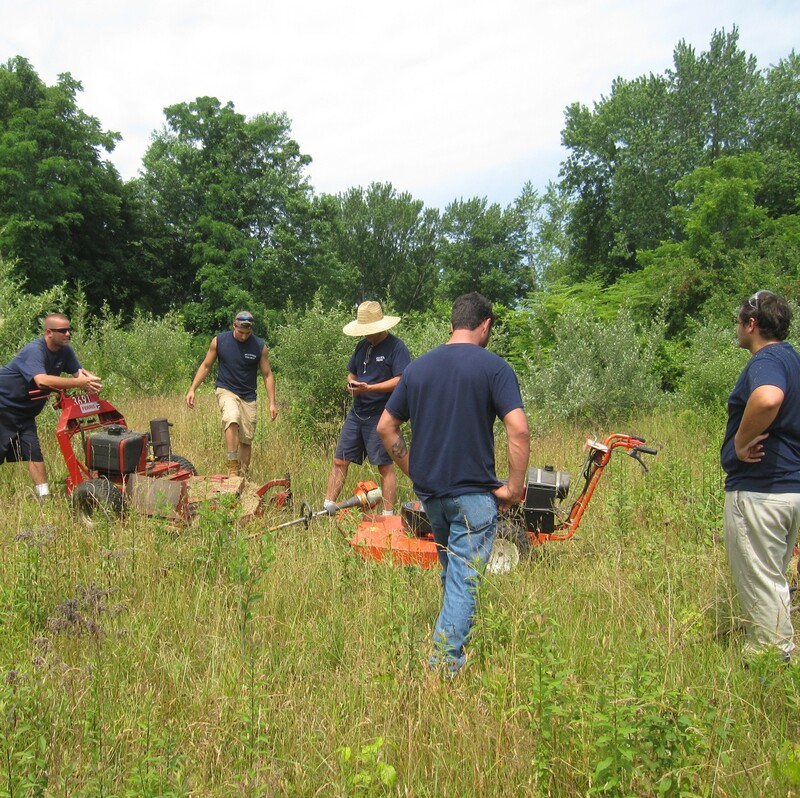 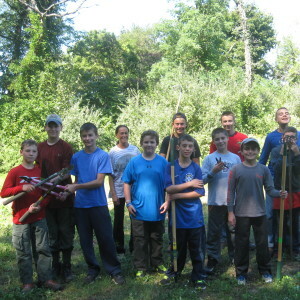 July 2, 2015: Thank you, Shawn C., Matt, Blaise, Shawn T., Jim, Owen, and Dave from Huntington’s General Services for the great work you did cutting amazing trails at Carpenter Farm Park. 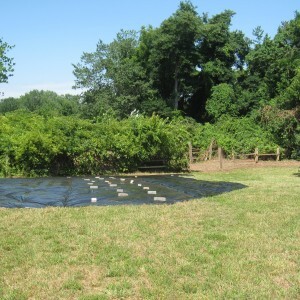 And thank you Keith, Joe, David, Christian, and Margo for making it happen. 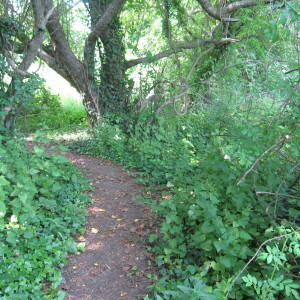 A gentle walk through this very beautiful landscape starts at the open park entrance where the trail begins. 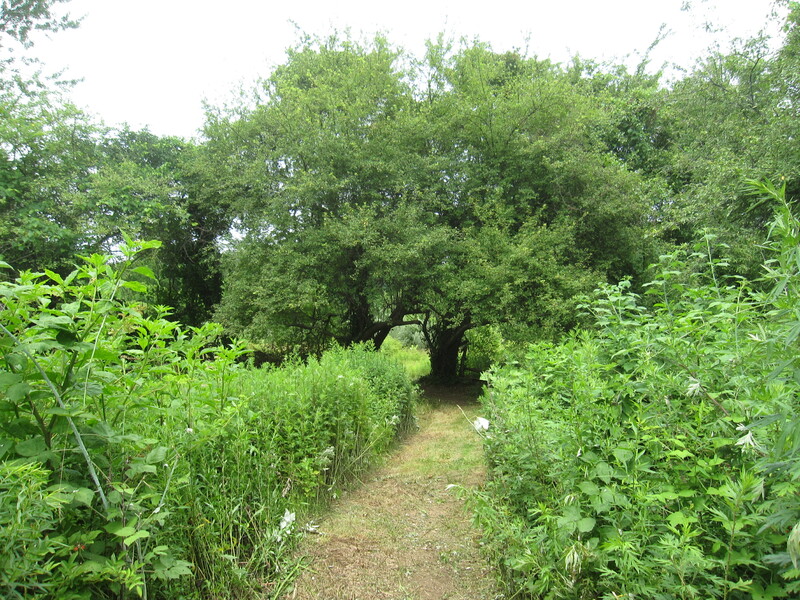 Walk down a winding trail to this heritage crab apple tree and enjoy its shade. 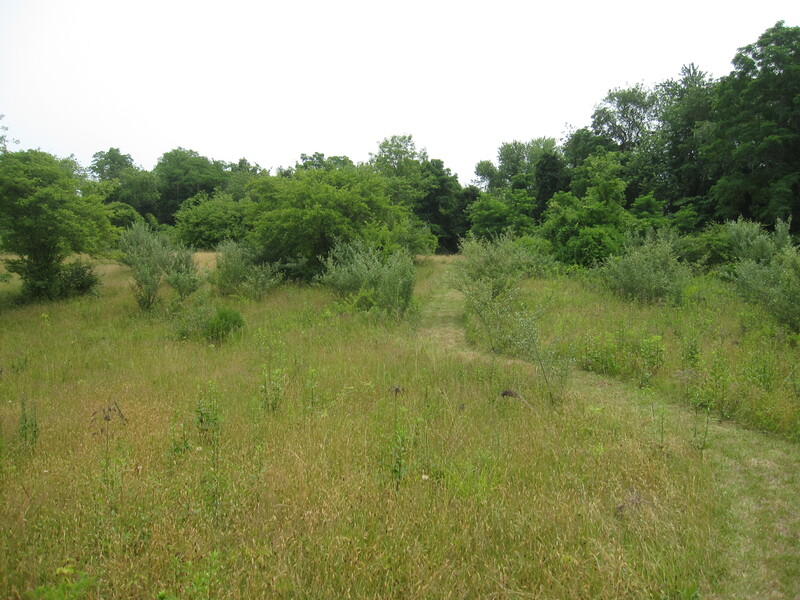 This first meadow adjacent to the former horse paddock will be restored to native grasses. 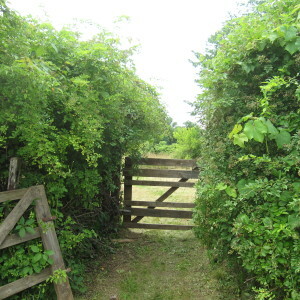 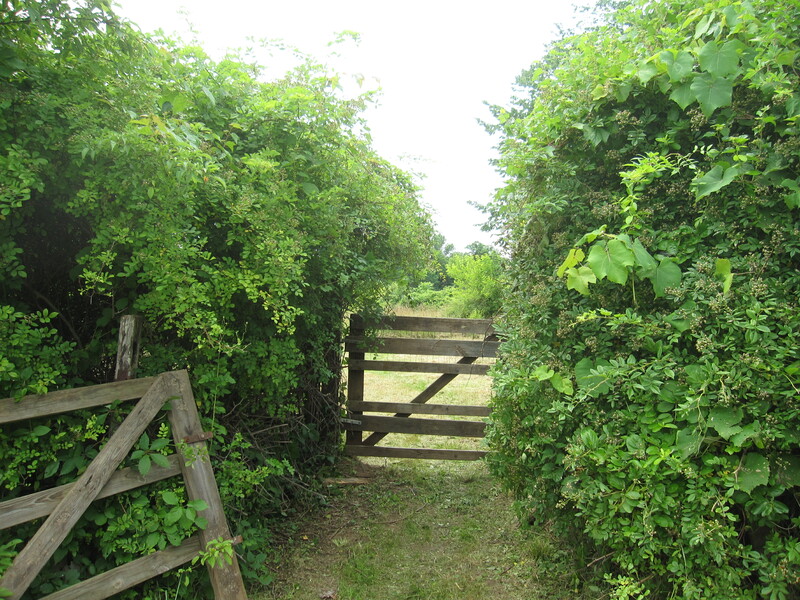 Pass through this gate and discover the beginning of the greater meadow as you follow the trail down its gentle slope. 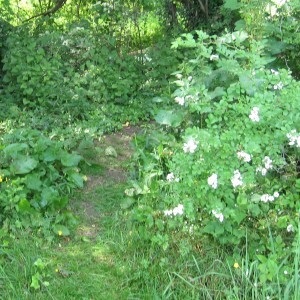 The trail along the north border meanders between the woodland and the grassland. 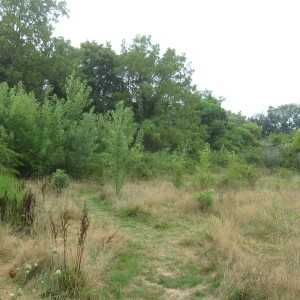 As the trail circumvents the meadow it switches back uphill along the south side. 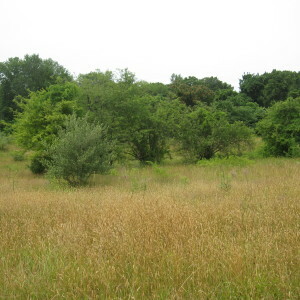 This is a partial view of the meadow from the top of the hill with heritage crabapple trees in the background. 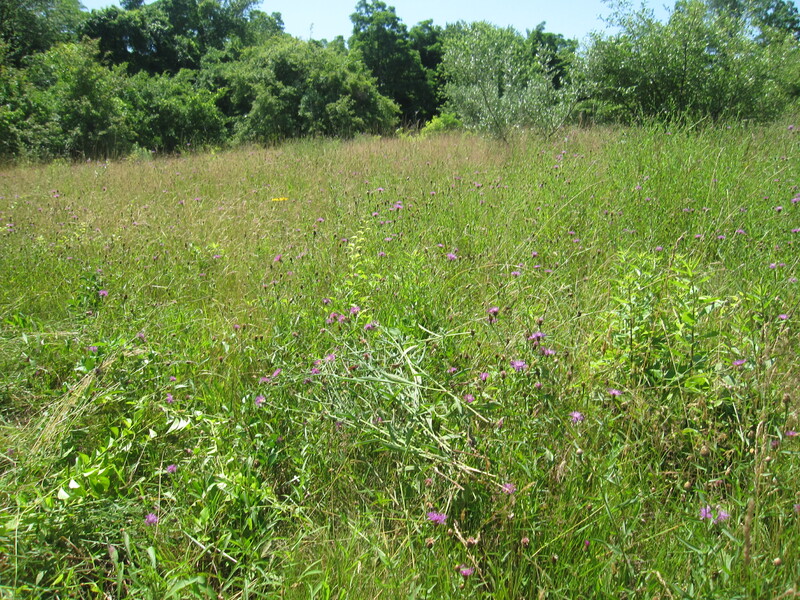 June 20, 2015: An infestation of purple flowering brown knapweed was found in an open area between the paddock and lower fence. 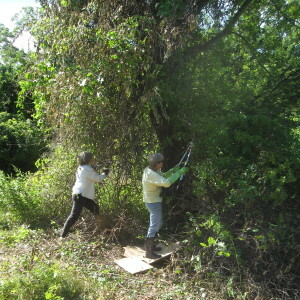 Marion Cristie, Deborah Hanley and Judy Lom pulled and cleared out this highly invasive plant species. 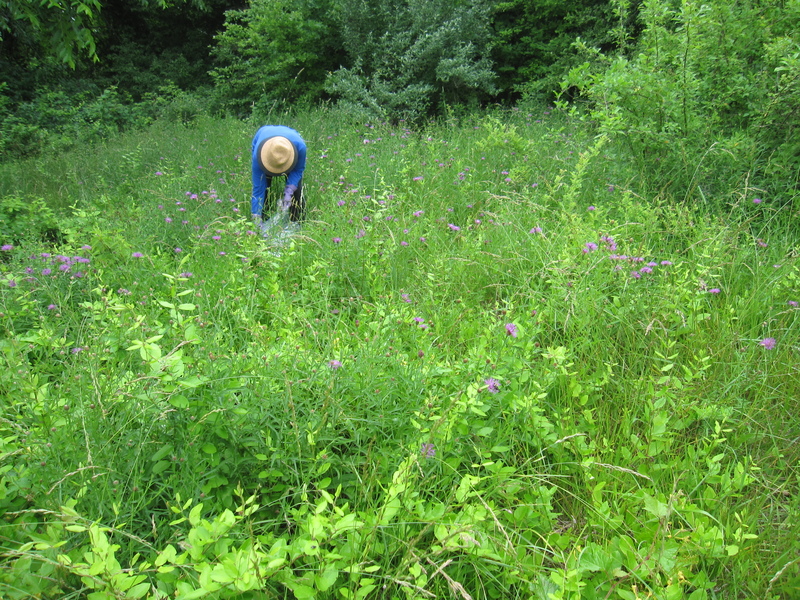 According to Wikipedia, the roots of brown knapweed exude an herbicide to inhibit competition by a wide range of other plant species. 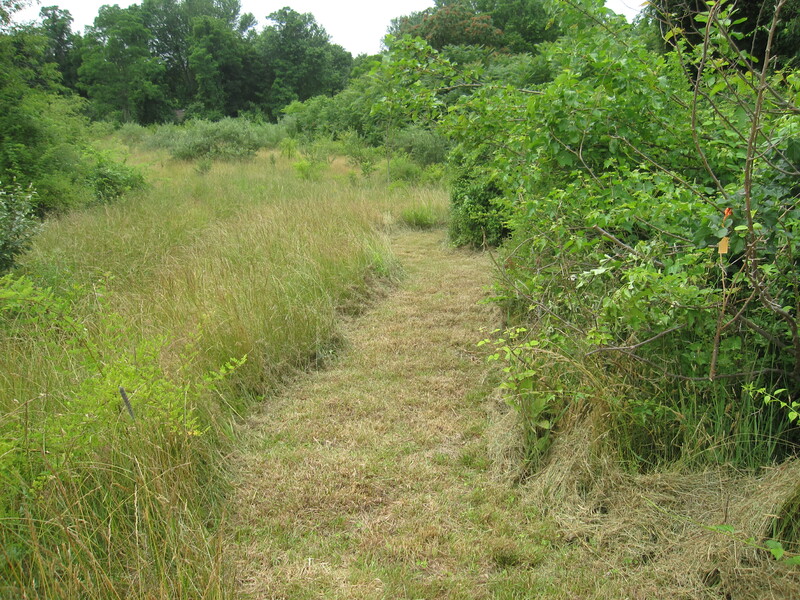 Consequently, when knapweed replaces native grasses, soil erosion and surface runoff increase. 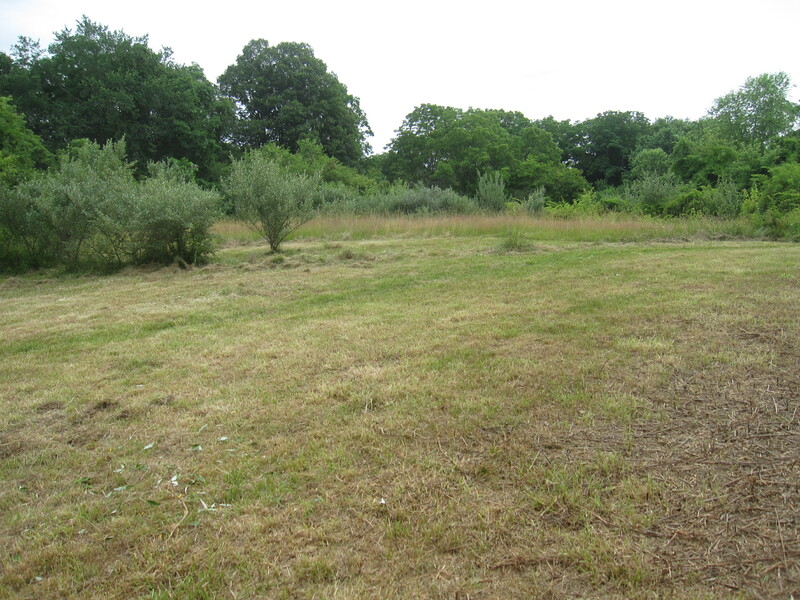 We soon discovered a large patch of Japanese stiltgrass growing behind the area cleared of knapweed. 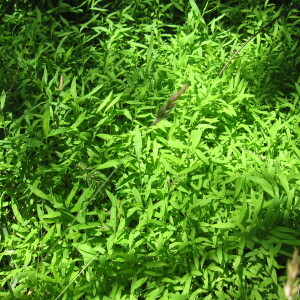 Most commonly an invader of forested floodplains, Japanese stiltgrass is found in ditches, forest edges, fields, and trails. 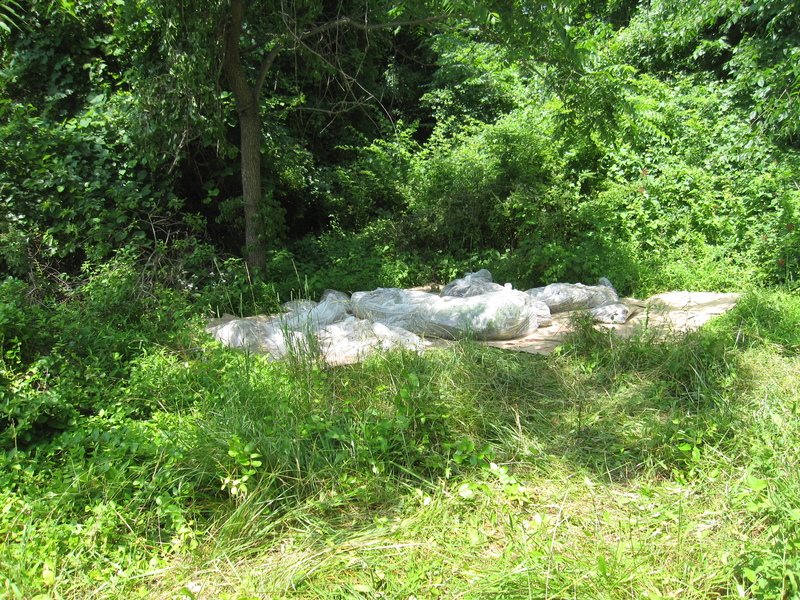 Because we needed a hidden yet convenient spot to solarize the clear bags of knapweed, we attempted to smother out the stiltgrass and cook the knapweed by laying the bags over the patch of grass. 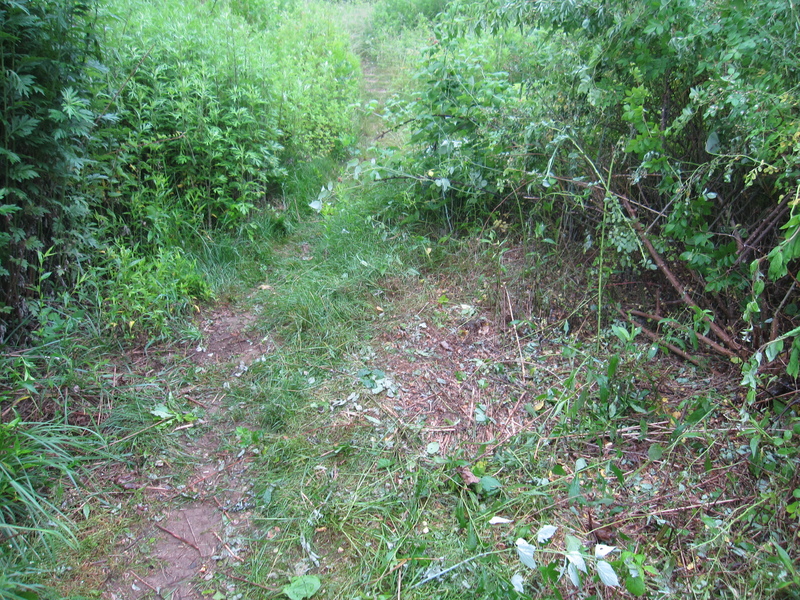 June 26, 2015: We uprooted this multiflora rose shrub growing into the trail, plus five additional shrubs to the right of the photo. Judy Lom and I cut the canes above the ground high enough for the weed wrench to grab. 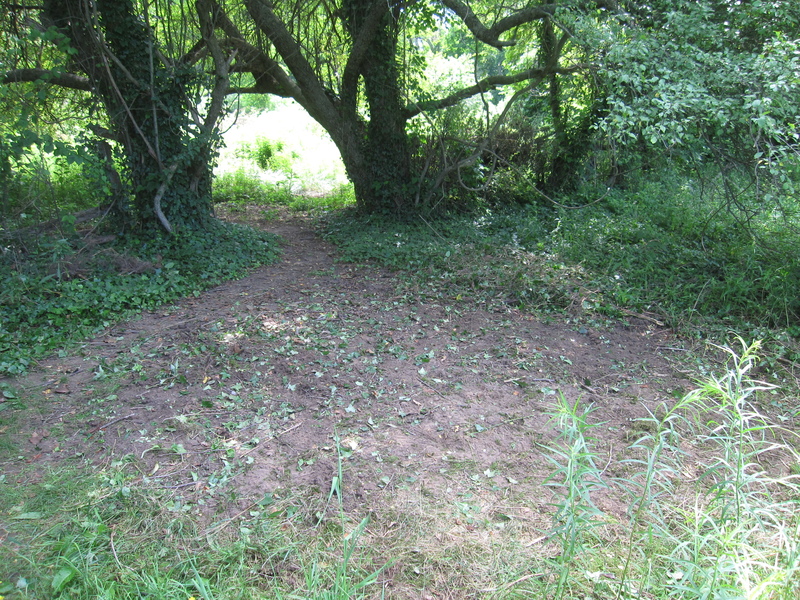 Then we sawed a circle in the ground around the stub to sever the lateral roots. 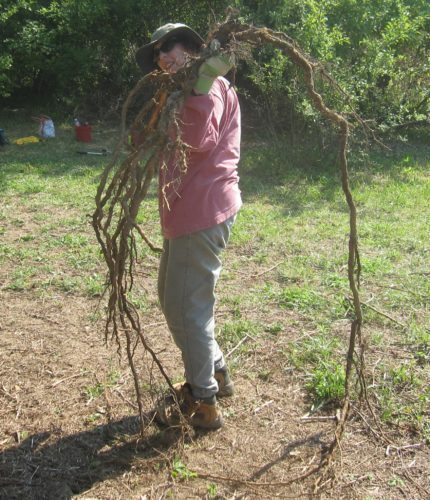 The large weed wrench uprooted the plant, and we pulled the remaining laterals. 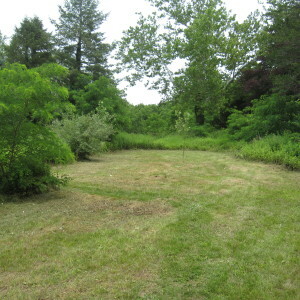 Once all the shrubs, poison ivy and English ivy were gone I sowed the open ground with Indian grass seed. 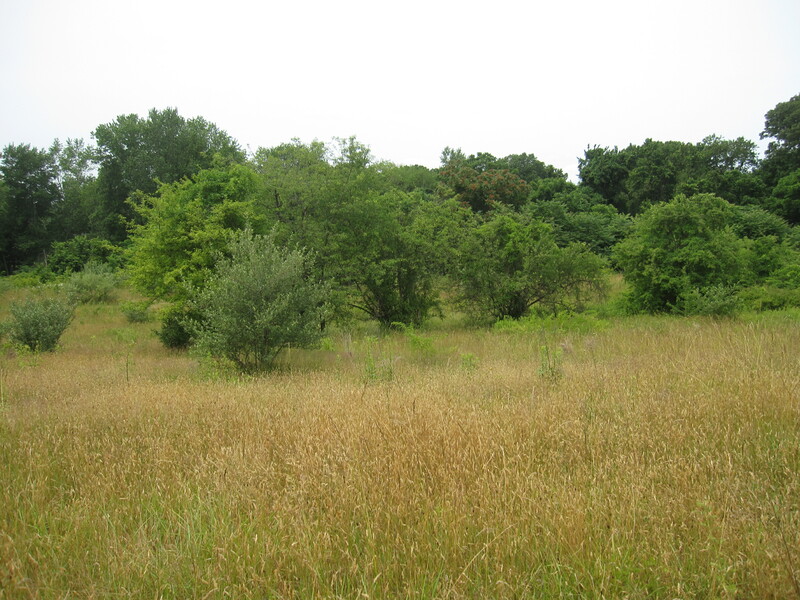 This area receives plenty of morning sunlight for growing native grass. 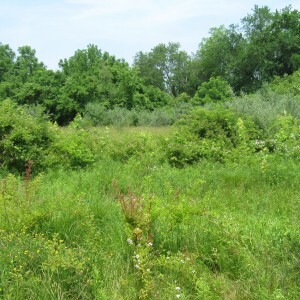 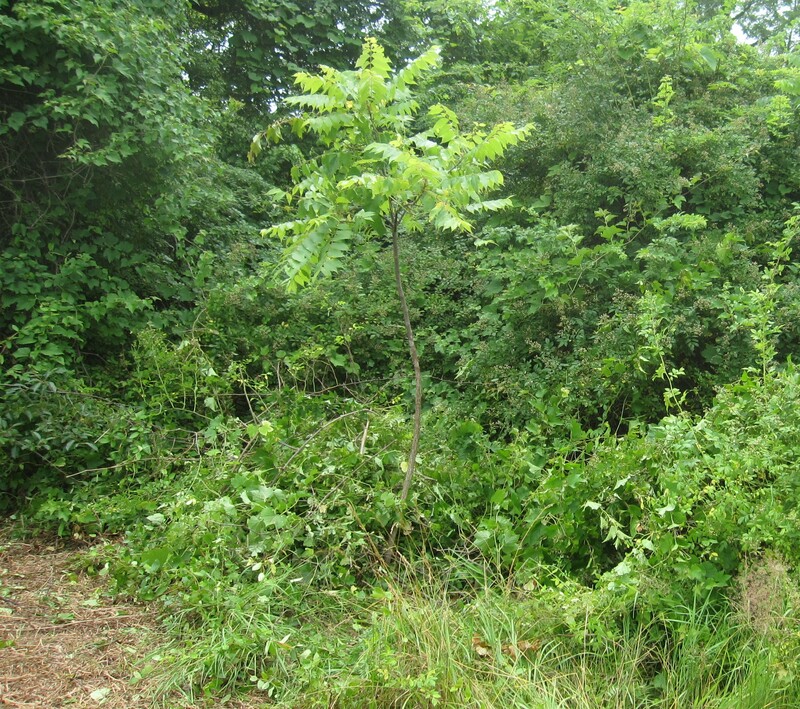 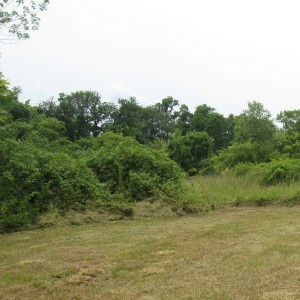 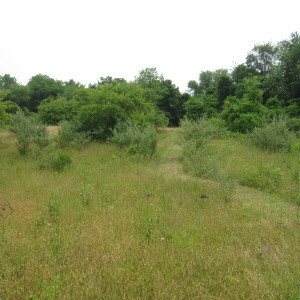 June 27, 2015: Barbara Wildfeir worked on the multiflora rose, Oriental bittersweet, porcelain berry and maple trees east of the trail and north of the upland fence, opening up this impassible area. 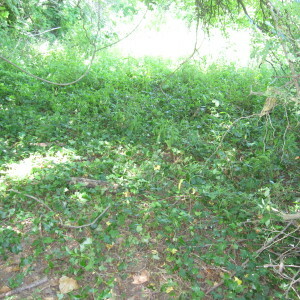 Still need to remove English ivy from along the ground before sowing seed. 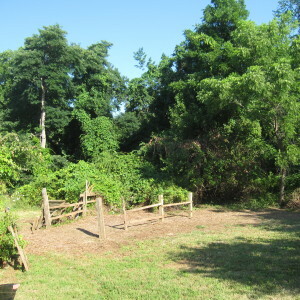 Looking good. 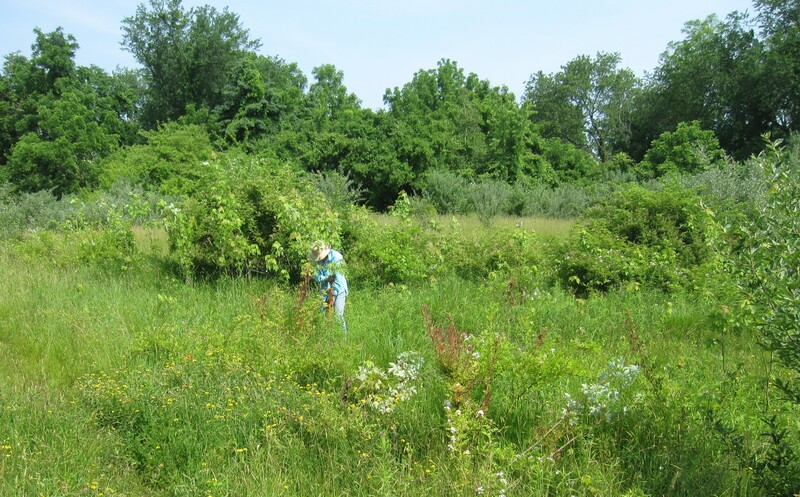 Along the fence that transects the Park’s upland trail, millions of garlic mustard seed pods were ready to disperse their seeds when volunteers with the Invasive Plant Sub Committee of Huntington’s Conservation Board went to work. 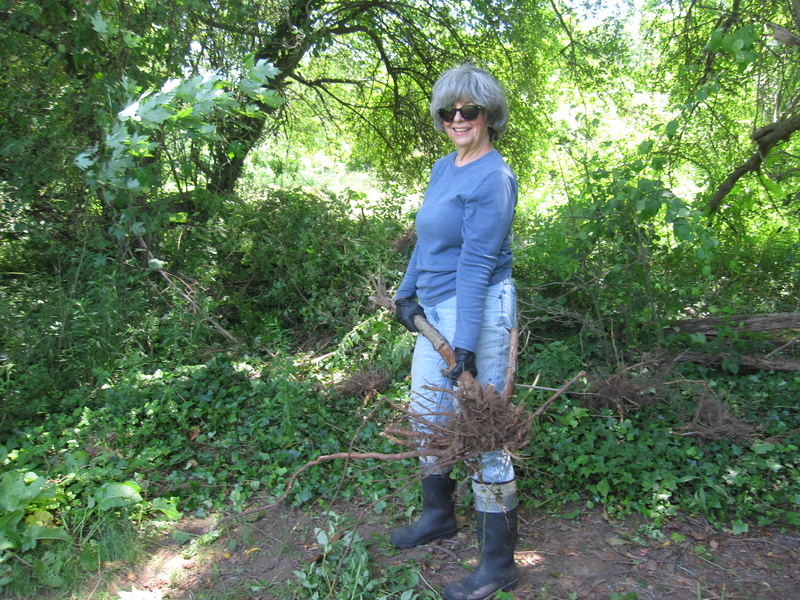 June 10, 2015: Volunteer Kate Levine helped pull a large section of non-native, highly invasive garlic mustard. 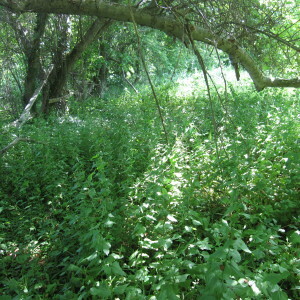 Many of these invasive plants are edible, which accounts for this European invasive being here. 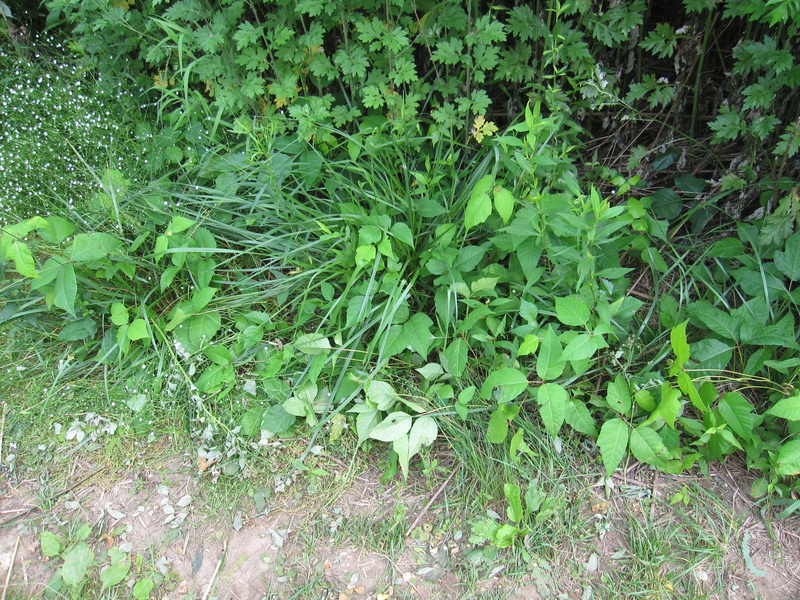 Pictured here after removing the stand of garlic mustard. Eventually the entire infestation, running several hundred feet long and roughly 50 feet wide on both sides of the fence, was cleared of this highly invasive plant. 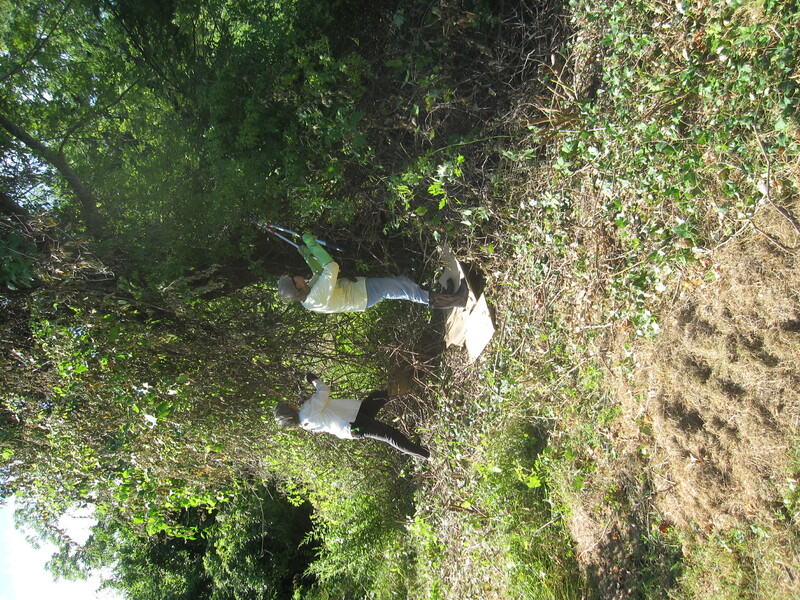 The stand of garlic mustard northeast of the fence was removed by Denise Harrington and her daughter, Jenna. 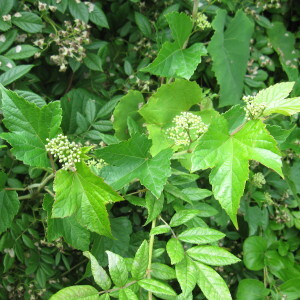 This biennial herb blooms and produces seeds only at the end of its second year when it uproots easily, but the seeds must be bagged & solarized. 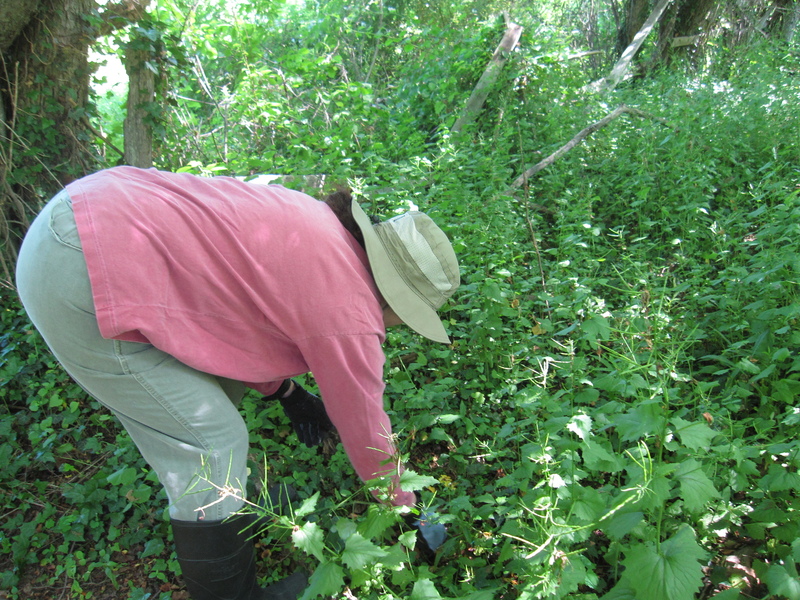 After pulling the garlic mustard we discovered English ivy hidden beneath. 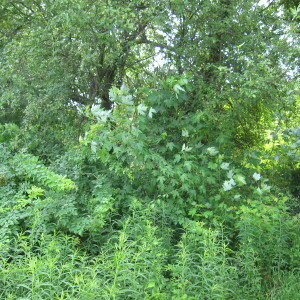 Removing that, however, can wait until late fall when vines are easier to reach. 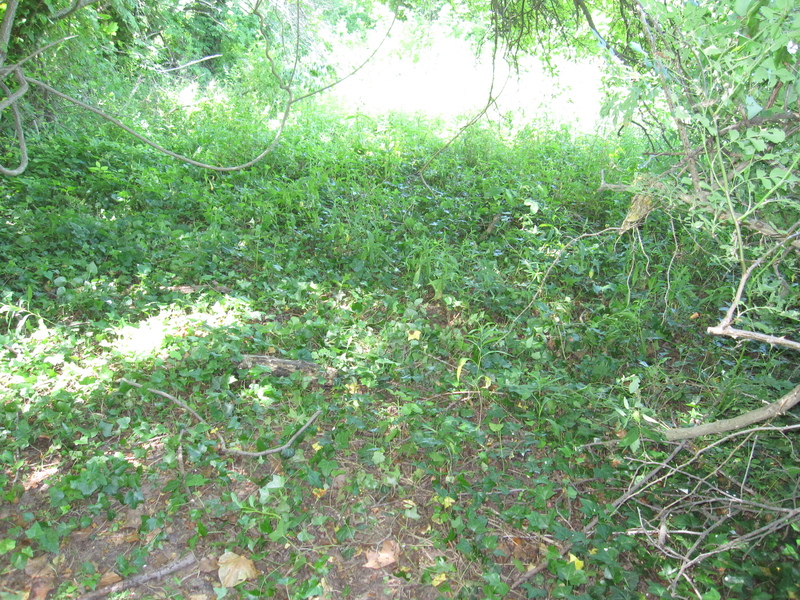 Because English ivy doesn’t produce its toxic ripe berries until late fall, there’s no rush. 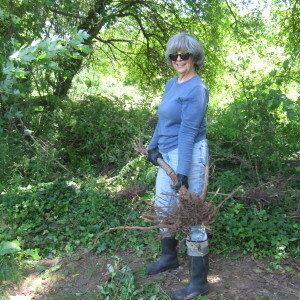 June 12, 2015: Anne Meyer (pictured) and her husband Rich uprooted over 100 seedlings and small saplings of Freeman maple (hybrid of red and silver maples) with the use of weed wrenches. 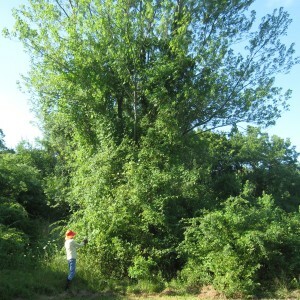 The largest sapling was nearly 12 feet tall. 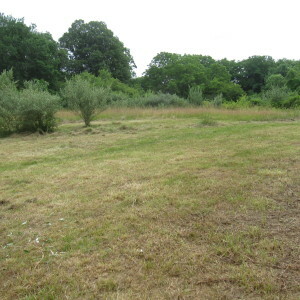 Pictured here in the meadow adjacent to the old horse paddock are the remaining maples after the first pull. 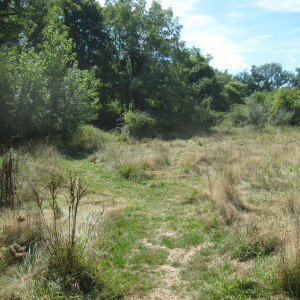 There’s still more maples in this field and much more plus invasive shrubs in the larger meadow further down the trail. 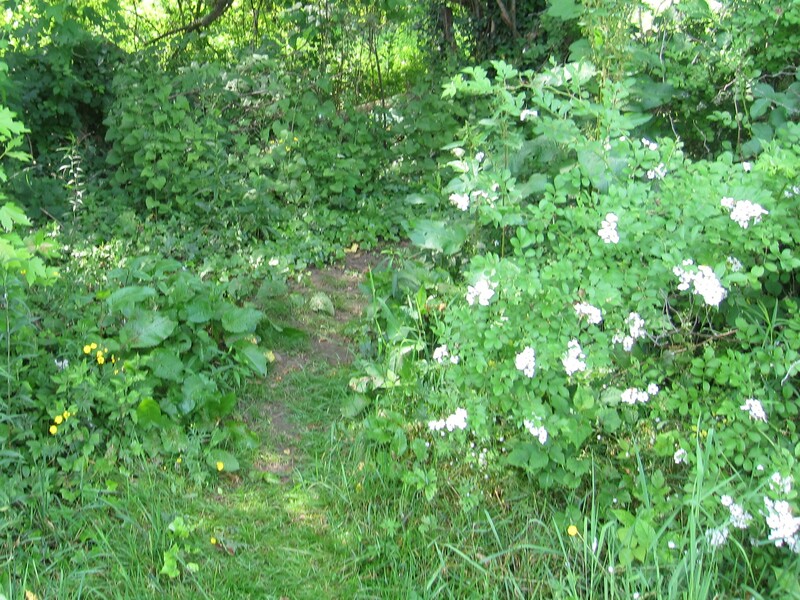 Can you find the trail? 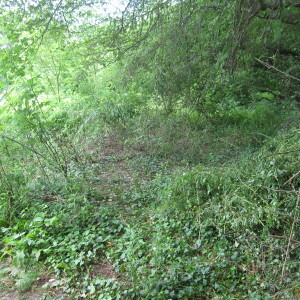 This is what remained of the upland trail after woody and herbaceous plants took over. 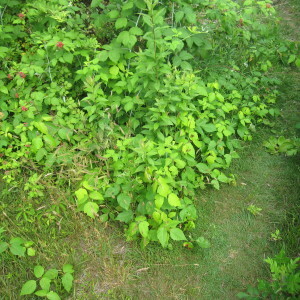 The invasive multiflora rose outcompetes native raspberries, and mugwort out-competes native goldenrod; but native poison ivy is also an issue on the trail. 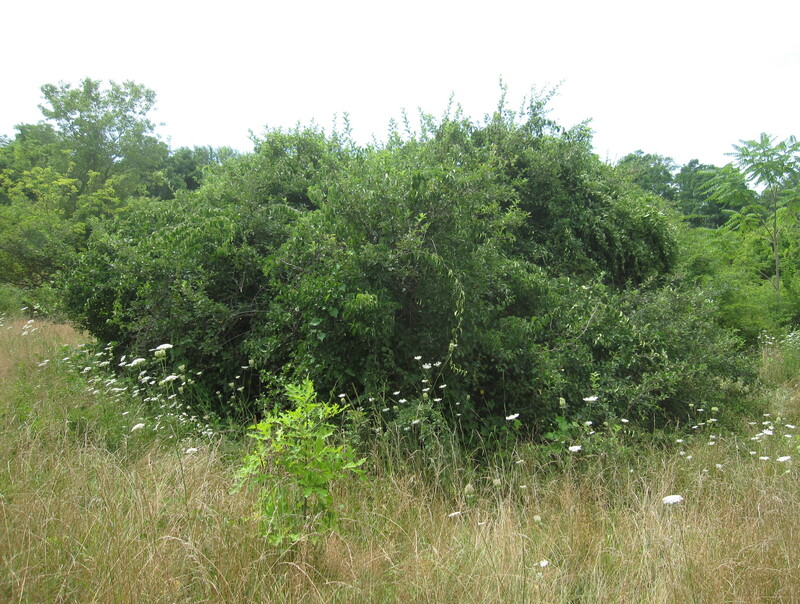 June 19, 2015: Multiflora rose is widespread throughout this park. 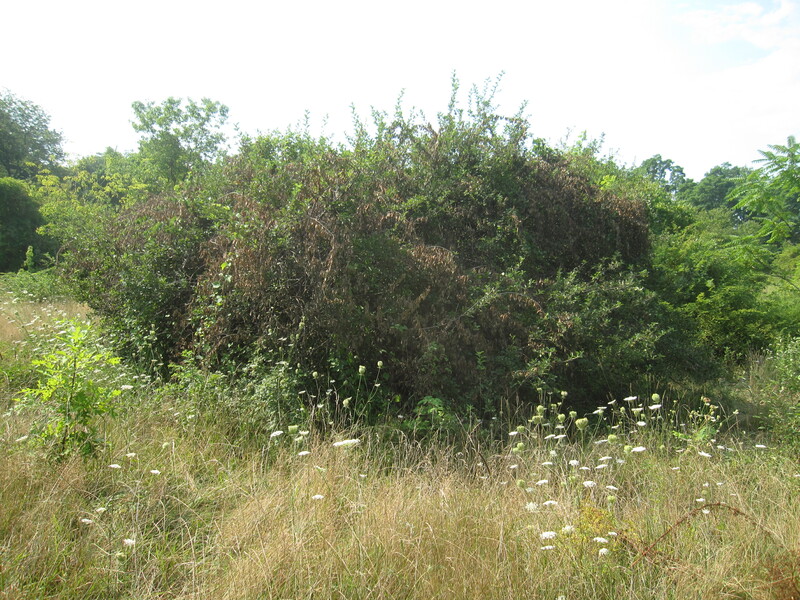 The week before this picture was taken these very sharp, thorny shrubs were covered in white flowers. 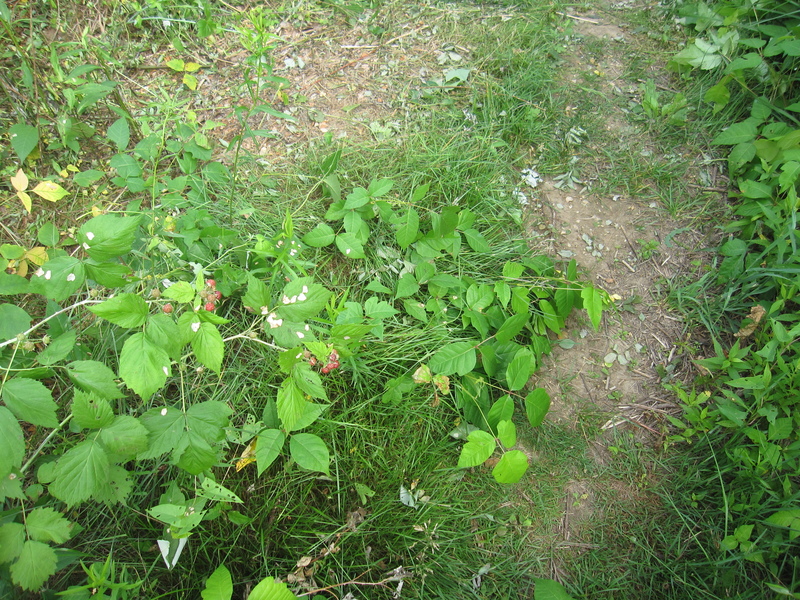 Now, millions of small red berries will grow to disperse new seed. 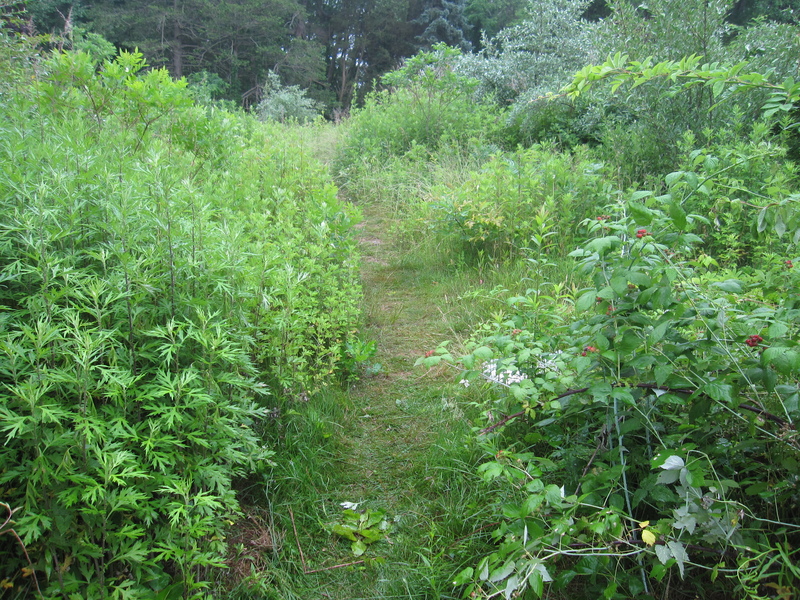 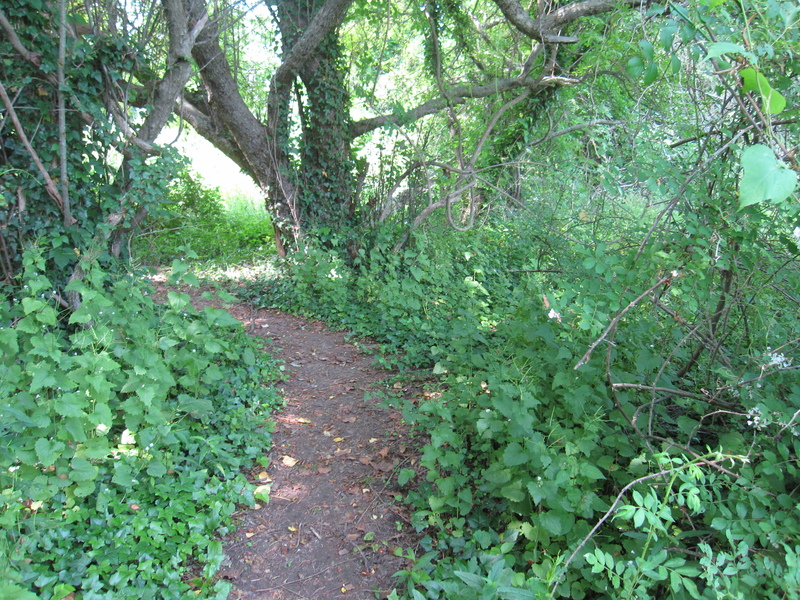 The path opened up once the multiflora rose was cut to the ground and removed. 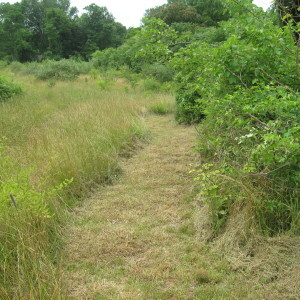 We seeded the bare soil with native warm season grasses to prevent invasive woody plants and other weeds from reseeding. 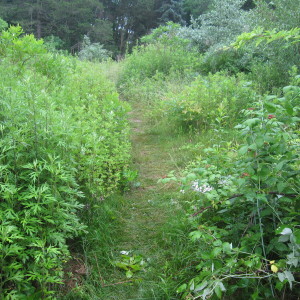 Eventually the trail will be routinely mowed. 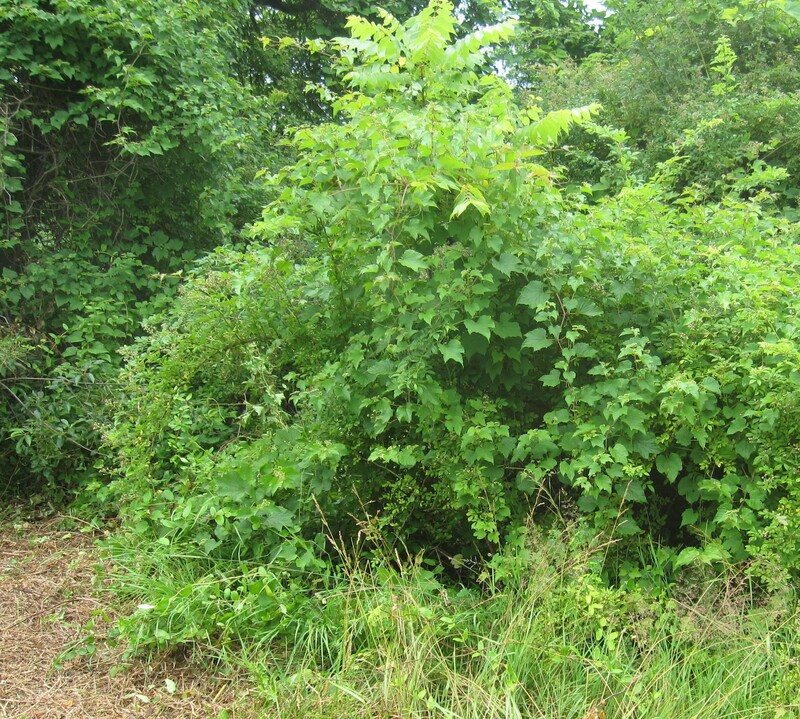 June 20, 2015: Poison ivy was found in several places along the upland trail; their white flowers had already grown and died. 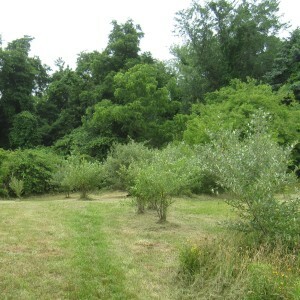 Now they are producing small green berries, which will ripen to off-white. 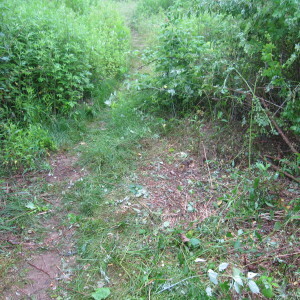 Cautiously covered from head to toe I uprooted all the poison ivy along the upland trail. 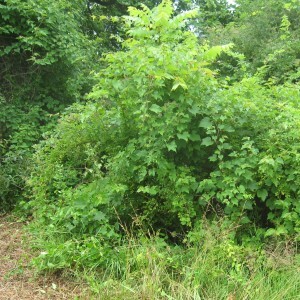 We are the only known species allergic to poison ivy. 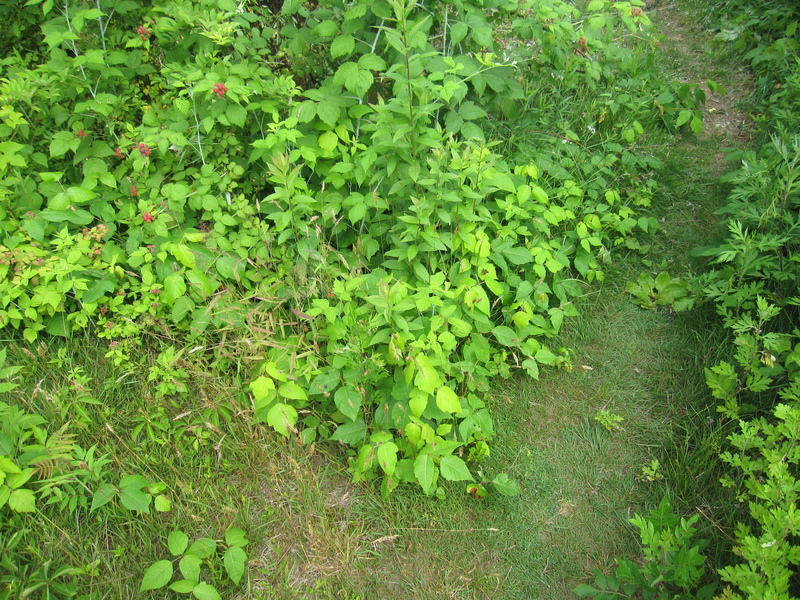 Birds especially enjoy the berries, which is how the plant spreads. 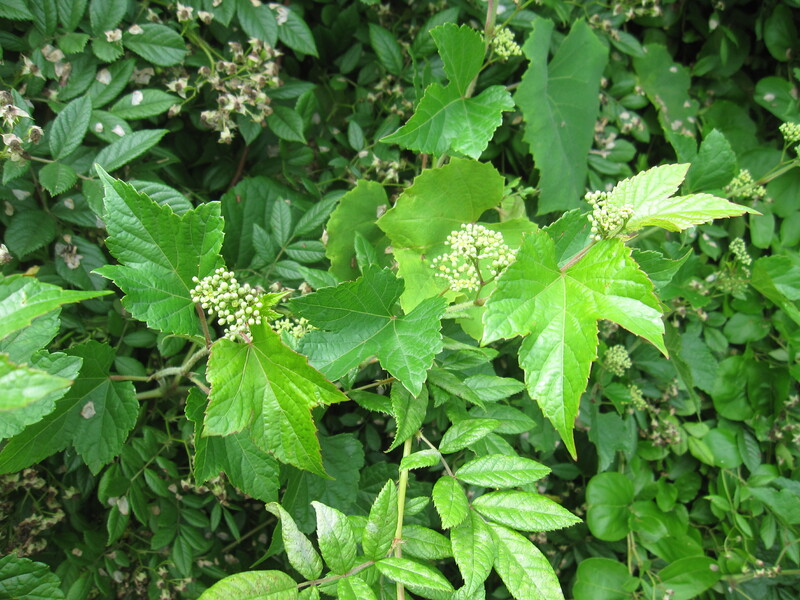 Poison ivy is a native Long Island plant species and grows best along our woodland edges and trails where it climbs trees to reach sunlight at the top of the canopy. 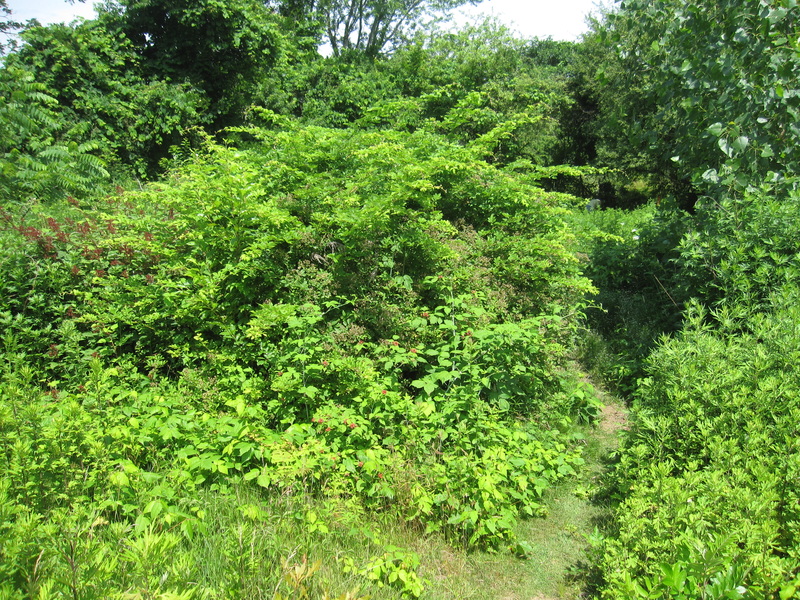 Upland trail without poison ivy and multiflora rose. 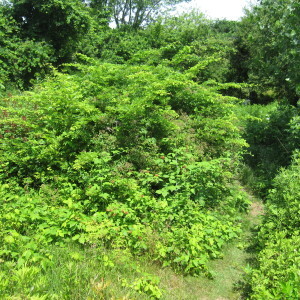 Today, the upland trail at Carpenter Farm Park is less obscured by shrubs and poison ivy — at least for now — due to the efforts of its dedicated volunteers.